See also Brain on Wikipedia; and our 1911 Encyclopædia Britannica disclaimer. BRAIN (A.S. braegen), that part of the central nervous system which in vertebrate animals is contained within the cranium or skull; it is divided into the great brain or cerebrum, the hind brain or cerebellum, and the medulla oblongata, which is the transitional part between the spinal cord and the other two parts already named. Except where stated, we deal here primarily with the brain in man. Membranes of the Human Brain. ⁠Fig. 1.—Dura Mater and Cranial Sinuses. 9 and 10. Superior and inferior petrosal sinus. 12. Circular sinus which connects the two cavernous sinuses together. 13. Ophthalmic vein, from 15, the eyeball. 14. Crista galli of ethmoid bone. of the skull, and is adherent along the lines of the sutures and to the margins of the foramina, which transmit the nerves, more especially to the foramen magnum. It forms, therefore, for these bones an internal periosteum, and the meningeal arteries which ramify in it are the nutrient arteries of the inner table. As the growth of bone is more active in infancy and youth than in the adult, the adhesion between the dura mater and the cranial bones is greater in early life than at maturity. From the inner surface of the dura mater strong bands pass into the cranial cavity, and form partitions between certain of the subdivisions of the brain. A vertical longitudinal mesial band, named, from its sickle shape, falx cerebri, dips between the two hemispheres of the cerebrum. A smaller sickle-shaped vertical mesial band, the falx cerebelli, attached to the internal occipital crest, passes between the two hemispheres of the cerebellum. A large band arches forward in the horizontal plane of the cavity, from the transverse groove in the occipital bone to the clinoid processes of the sphenoid, and is attached laterally to the upper border of the petrous part of each temporal bone. It separates the cerebrum from the cerebellum, and, as it forms a tent-like covering for the latter, is named tentorium cerebelli. Along certain lines the cranial dura mater splits into two layers to form tubular passages for the transmission of venous blood. These passages are named the venous blood sinuses of the dura mater, and they are lodged in the grooves on the inner surface of the skull referred to in the description of the cranial bones. Opening into these sinuses are numerous veins which convey from the brain the blood that has been circulating through it; and two of these sinuses, called cavernous, which lie at the sides of the body of the sphenoid bone, receive the ophthalmic veins from the eyeballs situated in the orbital cavities. These blood sinuses pass usually from before backwards: a superior longitudinal along the upper border of the falx cerebri as far as the internal occipital protuberance; an inferior longitudinal along its lower border as far as the tentorium, where it joins the straight sinus, which passes back as far as the same protuberance. One or two small occipital sinuses, which lie in the falx cerebelli, also pass to join the straight and longitudinal sinuses opposite this protuberance; several currents of blood meet, therefore, at this spot, and as Herophilus supposed that a sort of whirlpool was formed in the blood, the name torcular Herophili has been used to express the meeting of these sinuses. From the torcular the blood is drained away by two large sinuses, named lateral, which curve forward and downward to the jugular foramina to terminate in the internal jugular veins. In its course each lateral sinus receives two petrosal sinuses, which pass from the cavernous sinus backwards along the upper and lower borders of the petrous part of the temporal bone. The dura mater consists of a tough, fibrous membrane, somewhat flocculent externally, but smooth, glistening, and free on its inner surface. The inner surface has the appearance of a serous membrane, and when examined microscopically is seen to consist of a layer of squamous endothelial cells. Hence the dura mater is sometimes called a fibro-serous membrane. The dura mater is well provided with lymph vessels, which in all probability open by stomata on the free inner surface. Between the dura mater and the subjacent arachnoid membrane is a fine space containing a minute quantity of limpid serum, which moistens the smooth inner surface of the dura and the corresponding smooth outer surface of the arachnoid. It is regarded as equivalent to the cavity of a serous membrane, and is named the sub-dural space. Arachnoid Mater.—The arachnoid is a membrane of great delicacy and transparency, which loosely envelops both the brain and spinal cord. It is separated from these organs by the pia mater; but between it and the latter membrane is a distinct space, called sub-arachnoid. The sub-arachnoid space is more distinctly marked beneath the spinal than beneath the cerebral parts of the membrane, which forms a looser investment for the cord than for the brain. At the base of the brain, and opposite the fissures between the convolutions of the cerebrum, the interval between the arachnoid and the pia mater can, however, always be seen, for the arachnoid does not, like the pia mater, clothe the sides of the fissures, but passes directly across between the summits of adjacent convolutions. The sub-arachnoid space is subdivided into numerous freely-communicating loculi by bundles of delicate areolar tissue, which bundles are invested, as Key and Retzius have shown, by a layer of squamous endothelium. The space contains a limpid cerebro-spinal fluid, which varies in quantity from 2 drachms to 2 oz., and is most plentiful in the dilatations at the base of the brain known as cisternae. It should be clearly understood that there is no communication between the subdural and sub-arachnoid spaces, but that the latter communicates with the ventricles through openings in the roof of the fourth, and in the descending cornua of the lateral ventricles. When the skull cap is removed, clusters of granular bodies are usually to be seen imbedded in the dura mater on each side of the superior longitudinal sinus; these are named the Pacchionian bodies. When traced through the dura mater they are found to spring from the arachnoid. The observations of Luschka and Cleland have proved that villous processes invariably grow from the free surface of that membrane, and that when these villi greatly increase in size they form the bodies in question. Sometimes the Pacchionian bodies greatly hypertrophy, occasioning absorption of the bones of the cranial vault and depressions on the upper surface of the brain. After D. J. Cunningham's Text-book of Anatomy. Fig. 2.—Front View of the Medulla, Pons and Mesencephalon of a full-time Human Foetus. Pia Mater.—This membrane closely invests the whole outer surface of the brain. It dips into the fissures between the convolutions, and a wide prolongation, named velum interpositum, lies in the interior of the cerebrum. With a little care it can be stripped off the brain without causing injury to its substance. At the base of the brain the pia mater is prolonged on to the roots of the cranial nerves. This membrane consists of a delicate connective tissue, in which the arteries of the brain and spinal cord ramify and subdivide into small branches before they penetrate the nervous substance, and in which the veins conveying the blood from the nerve centres lie before they open into the blood sinuses of the cranial dura mater and the extradural venus plexus of the spinal canal. The Medulla Oblongata rests upon the basi-occipital. It is somewhat pyramidal in form, about 1¼ in. long, and 1 in. broad in its widest part. It is a bilateral organ, and is divided into a right and a left half by shallow anterior and posterior median fissures, continuous with the corresponding fissures in the spinal cord; the posterior fissure ends above in the fourth ventricle. Each half is subdivided into elongated tracts of nervous matter. Next to, and parallel with the anterior fissure is the anterior pyramid (see fig. 2). This pyramid is continuous below with the cord, and the place of continuity is marked by the passage across the fissure of three or four bundles of nerve fibres, from each half of the cord to the opposite anterior pyramid; this crossing is called the decussation of the pyramids. To the side of the pyramid, and separated from it by a faint fissure, is the olivary fasciculus, which at its upper end is elevated into the projecting oval-shaped olivary body. Behind the olivary body in the lower half of the medulla are three tracts named from before backward the funiculus of Rolando, the funiculus cuneatus and the funiculus gracilis (see fig. 3). The two funiculi graciles of opposite sides are in contact in the mid dorsal line and have between them the postero median fissure. When the fourth ventricle is reached they diverge to form the lower limit of that diamond-shaped space and are slightly swollen to form the clavae. All these three bundles appear to be continued up into the cerebellum as the restiform bodies or inferior cerebellar peduncles, but really the continuity is very slight, as the restiform bodies are formed from the direct cerebellar tracts of the spinal cord joining with the superficial arcuate fibres which curve back just below the olivary bodies. The upper part of the fourth ventricle is bounded by the superior cerebellar peduncles which meet just before the inferior quadrigeminal bodies are reached. Stretching across between them is the superior medullary velum or valve of Vieussens, forming the upper part of the roof, while the inferior velum forms the lower part, and has an opening called the foramen of Majendie, through which the sub-arachnoid space communicates with the ventricle. The floor (see fig. 3) has two triangular depressions on each side of a median furrow; these are the superior and inferior fovea, the significance of which will be noticed in the development of the rhombencephalon. Running horizontally across the middle of the floor are the striae acusticae which are continued into the auditory nerve. The floor of the fourth ventricle is of special interest because a little way from the surface are the deep origins of all the cranial nerves from the fifth to the twelfth. (See Nerve, cranial). If a section is made transversely through the medulla about the apex of the fourth ventricle three important bundles of fibres are cut close to the mid line on each side (see fig. 4). The most anterior is the pyramid or motor tract, the decussation of which has been seen. Behind this is the mesial fillet or sensory tract, which has also decussated a little below the point of section, while farther back still is the posterior longitudinal bundle which is coming up from the anterior basis bundle of the cord. External to and behind the pyramid is the crenated section of the olivary nucleus, the surface bulging of which forms the olivary body. From Cunningham, Text-book of Anatomy. Fig. 3.—Back View of the Medulla, Pons and Mesencephalon of a full-time Human Foetus. The grey matter of the medulla oblongata, which contains numerous multipolar nerve cells, is in part continuous with the grey matter of the spinal cord, and in part consists of independent masses. As the grey matter of the cord enters the medulla it loses its crescentic arrangement. The posterior cornua are thrown outwards towards the surface, lose their pointed form, and dilate into rounded masses named the grey tubercles of Rolando. The grey matter of the anterior cornua is cut off from the rest by the decussating pyramids and finally disappears. The formatio reticularis which is feebly developed in the cord becomes well developed in the medulla. In the lower part of the medulla a central canal continuous with that of the cord exists, but when the clavae on the opposite sides of the medulla diverge from each other, the central canal loses its posterior boundary, and dilates into the cavity of the fourth ventricle. The grey matter in the interior of the medulla appears, therefore, on the floor of the ventricle and is continuous with the grey matter near the central canal of the cord. This grey matter forms collections of nerve cells, which are the centres of origin of several cranial nerves. Crossing the anterior surface of the medulla oblongata, immediately below the pons, in the majority of mammals is a transverse arrangement of fibres forming the trapezium, which contains a grey nucleus, named by van der Kolk the superior olive. In the human brain the trapezium is concealed by the lower transverse fibres of the pons, but when sections are made through it, as L. Clarke pointed out, the grey matter of the superior olive can be seen. These fibres of the trapezium come from the cochlear nucleus of the auditory nerve, and run up as the lateral fillet. ⁠Fig. 4.—Transverse Section through the Human Medulla in the Lower Olivary Region. The Pons Varolii or Bridge is cuboidal in form (see fig. 2): its anterior surface rests upon the dorsum sellae of the sphenoid, and is marked by a median longitudinal groove; its inferior surface receives the pyramidal and olivary tracts of the medulla oblongata; at its superior surface are the two crura cerebri; each lateral surface is in relation to a hemisphere of the cerebellum, and a peduncle passes from the pons into the interior of each hemisphere; the posterior surface forms in part the upper portion of the floor of the fourth ventricle, and in part is in contact with the corpora quadrigemina. The pons consists of white and grey matter: the nerve fibres of the white matter pass through the substance of the pons, in either a transverse or a longitudinal direction. The transverse fibres go from one hemisphere of the cerebellum to that of the opposite side; some are situated on the anterior surface of the pons, and form its superficial transverse fibres, whilst others pass through its substance and form the deep transverse fibres. The longitudinal fibres ascend from the medulla oblongata and leave the pons by emerging from its upper surface as fibres of the two crura cerebri. The pons possesses a median raphe continuous with that of the medulla oblongata, and formed like it by a decussation of fibres in the mesial plane. In a horizontal section through the pons and upper part of the fourth ventricle the superficial transverse fibres are seen most anteriorly; then come the anterior pyramidal fibres, then the deep transverse pontine fibres, then the fillet, while most posteriorly and close to the floor of the fourth ventricle the posterior longitudinal bundle is seen (see fig. 5). ⁠Fig. 5.—Section through the Lower Part of the Human Pons Varolli immediately above the Medulla. The grey matter of the pons is scattered irregularly through its substance, and appears on its posterior surface; but not on the anterior surface, composed exclusively of the superficial transverse fibres. The Cerebellum, Little Brain, or After Brain occupies the inferior pair of occipital fossae, and lies below the plane of the tentorium cerebelli. It consists of two hemispheres or lateral lobes, and of a median or central lobe, which in human anatomy is called the vermis. It is connected below with the medulla oblongata by the two restiform bodies which form its inferior peduncles, and above with the corpora quadrigemina of the cerebrum by two bands, which form its superior peduncles; whilst the two hemispheres are connected together by the transverse fibres of the pons, which form the middle peduncles of the cerebellum. On the superior or tentorial surface of the cerebellum the median or vermiform lobe is a mere elevation, but on its inferior or occipital surface this lobe forms a well-defined process, which lies at the bottom of a deep fossa or vallecula; this fossa is prolonged to the posterior border of the cerebellum, and forms there a deep notch which separates the two hemispheres from each other; in this notch the falx cerebelli is lodged. Extending horizontally backwards from the middle cerebellar peduncle, along the outer border of each hemisphere is the great horizontal fissure, which divides the hemisphere into its tentorial and occipital surfaces. Each of these surfaces is again subdivided by fissures into smaller lobes, of which the most important are the amygdala or tonsil, which forms the lateral boundary of the anterior part of the vallecula, and the flocculus, which is situated immediately behind the middle peduncle of the cerebellum. The inferior vermiform process is subdivided into a posterior part or pyramid; an elevation or uvula, situated between the two tonsils; and an anterior pointed process or nodule. Stretching between the two flocculi, and attached midway to the sides of the nodule, is a thin, white, semilunar-shaped plate of nervous matter, called the inferior medullary velum. Fig. 6.—Mesial section through the Corpus Callosum, the Mesencephalon, the Pons, Medulla and Cerebellum. Showing the third and fourth ventricles joined by the aqueduct of Sylvius. The whole outer surface of the cerebellum possesses a characteristic foliated or laminated appearance, due to its subdivision into multitudes of thin plates or lamellae by numerous fissures. The cerebellum consists of both grey and white matter. The grey matter forms the exterior or cortex of the lamellae, and passes from one to the other across the bottoms of the several fissures. The white matter lies in the interior of the organ, and extends into the core of each lamella. When a vertical section is made through the organ, the prolongations of white matter branching off into the interior of the several lamellae give to the section an arborescent appearance, known by the fanciful name of arbor vitae (see fig. 6). Independent masses of grey matter are, however, found in the interior of the cerebellum. If the hemisphere be cut through a little to the outer side of the median lobe, a zigzag arrangement of grey matter, similar in appearance and structure to the nucleus of the olivary body in the medulla oblongata, and known as the corpus dentatum of the cerebellum, is seen; it lies in the midst of the white core of the hemisphere, and encloses white fibres, which leave the interior of the corpus at its inner and lower side. On the mesial side of this corpus dentatum lie three smaller nuclei. The white matter is more abundant in the hemispheres than in the median lobe, and is for the most part directly continuous with the fibres of the peduncles of the cerebellum. Thus the restiform or inferior peduncles pass from below upward through the white core, to end in the grey matter of the tentorial surface of the cerebellum, more especially in that of the central lobe; on their way they are connected with the grey matter of the corpus dentatum. The superior peduncles, which descend from the corpora quadrigemina of the cerebrum, form connexions mainly with the corpus dentatum. The middle peduncles form a large proportion of the white core, and their fibres terminate in the grey matter of the foliated cortex of the hemispheres. It has been noticed that those fibres which are lowest in the pons go to the upper surface of the cerebellum and vice versa. Histology of the Cerebellum.—The white centre of the cerebellum is composed of numbers of medullated nerve fibres coursing to and from the grey matter of the cortex. These fibres are supported in a groundwork of neuroglial tissue, their nutrition being supplied by a small number of blood vessels. Fig. 7.—Transverse Section through a Cerebellar Folium (after Kölliker). Treated by the Golgi method. P. Axon of cell of Purkinje. ⁠the dendrites of the cells of Purkinje. GR. Granule cell. GR1. Axons of granule cells in molecular layer cut transversely. ZK. Basket-work around the cells of Purkinje. N. Axon of an association cell. The cortex (see fig. 7) consists of a thin layer of grey material forming an outer coat of somewhat varying thickness over the whole external surface of the laminae of the organ. When examined microscopically it is found to be made up of two layers, an outer “molecular” and an inner “granular” layer. Forming a layer lying at the junction of these two are a number of cells, the cells of Purkinje, which constitute the most characteristic feature of the cerebellum. The bodies of these cells are pear-shaped. Their inner ends taper and finally end in a nerve fibre which may be traced into the white centre. In their course through the granule layer they give off a number of branching collaterals, some turning back and passing between the cells of Purkinje into the molecular layer. Their inner ends terminate in one or sometimes two stout processes which repeatedly branch dichotomously, thus forming a very elaborate dendron in the molecular layer. The branchings of this dendron are also highly characteristic in that they are approximately restricted to a single plane like an espalier fruit tree, and those for neighbouring cells are all parallel to one another and at right angles to the general direction of the folium to which they belong. In the molecular layer are found two types of cells. The most abundant are the so-called basket cells which are distributed through the whole thickness of the layer. They have a rounded body giving off many branching dendrons to their immediate neighbourhood and one long neuraxon which runs parallel to the surface and to the long axis of the lamina. In its course, this gives off numerous collaterals which run downward to the bodies of Purkinje's cells. Their terminal branchings together with similar terminals of other collaterals form the basket-work around the bodies of these cells. The granular layer is sometimes termed the rust-coloured layer from its appearance to the naked eye. It contains two types of nerve cells, the small granule cells and the large granule cells. The former are the more numerous. They give off a number of short dendrites with claw-like endings, and a fine non-medullated neuraxon process. This runs upward to the cortex, where it divides into two branches in the form of a T. The branches run for some distance parallel to the axis of the folium and terminate in unbranched ends. The large granule cells are multipolar cells, many of the branchings penetrating well into the molecular layer. The neuraxon process turns into the opposite direction and forms a richly branching system through the entire thickness of the granular layer. There is also an abundant plexus of fine medullated fibres within the granule layer. The fibres of the white central matter are partly centrifugal, the neuraxons of the cells of Purkinje, and partly centripetal. The position of the cells of these latter fibres is not known. The fibres give rise to an abundant plexus of fibrils in the granular layer, and many reaching into the molecular layer ramify there, especially in the immediate neighbourhood of the dendrites of Purkinje's cells. From the appearance of their plexus of fibrils these are sometimes called moss fibres. The Fourth Ventricle is the dilated upper end of the central canal of the medulla oblongata. Its shape is like an heraldic lozenge. Its floor is formed by the grey matter of the posterior surfaces of the medulla oblongata and pons, already described (see figs. 3 and 6); its roof partly by the inferior vermis of the cerebellum, the nodule of which projects into its cavity, and partly by a thin layer, called valve of Vieussens, or superior medullary velum; its lower lateral boundaries by the divergent clavae and restiform bodies; its upper lateral boundaries by the superior peduncles of the cerebellum. The inferior medullary velum, a reflection of the pia mater and epithelium from the back of the medulla to the inferior vermis, closes it in below. Above, it communicates with the aqueduct of Sylvius, which is tunnelled below the substance of the corpora quadrigemina. Along the centre of the floor is the median furrow, which terminates below in a pen-shaped form, the so-called calamus scriptorius. Situated on its floor are the fasciculi teretes, striae acusticae, and deposits of grey matter described in connexion with the medulla oblongata. Its epithelial lining is continuous with that of the central canal. The Cerebrum or Great Brain lies above the plane of the tentorium, and forms much the largest division of the encephalon. It is customary in human anatomy to include under the name of cerebrum, not only the convolutions, the corpora striata, and the optic thalami, developed in the anterior cerebral vesicle, but also the corpora quadrigemina and crura cerebri developed in the mesencephalon or middle cerebral vesicle. The cerebrum is ovoid in shape, and presents superiorly, anteriorly and posteriorly a deep median longitudinal fissure, which subdivides it into two hemispheres. Inferiorly there is a continuity of structure between the two hemispheres across the mesial plane, and if the two hemispheres be drawn asunder by opening out the longitudinal fissure, a broad white band, the corpus callosum, may be seen at the bottom of the fissure passing across the mesial plane from one hemisphere to the other. The outer surface of each hemisphere is convex, and adapted in shape to the concavity of the inner table of the cranial bones; its inner surface, which bounds the longitudinal fissure, is flat and is separated from the opposite hemisphere by the falx cerebri; its under surface, where it rests on the tentorium, is concave, and is separated by that membrane from the cerebellum and pons. From the front of the pons two strong white bands, the crura cerebri or cerebral peduncles, pass forward and upward (see fig. 2). Winding round the outer side of each crus is a flat white band, the optic tract. These tracts converge in front, and join to form the optic commissure, from which the two optic nerves arise. The crura cerebri, optic tracts, and optic commissure enclose a lozenge-shaped space, which includes—(a) a grey layer, which, from being perforated by several small arteries, is called locus perforatus posticus; (b) two white mammillae, the corpora albicantia; (c) a grey nodule, the tuber cinereum, from which (d) the infundibulum projects to join the pituitary body. Immediately in front of the optic commissure is a grey layer, the lamina cinerea of the third ventricle; and between the optic commissure and the inner end of each Sylvian fissure is a grey spot perforated by small arteries, the locus perforatus anticus. Fig. 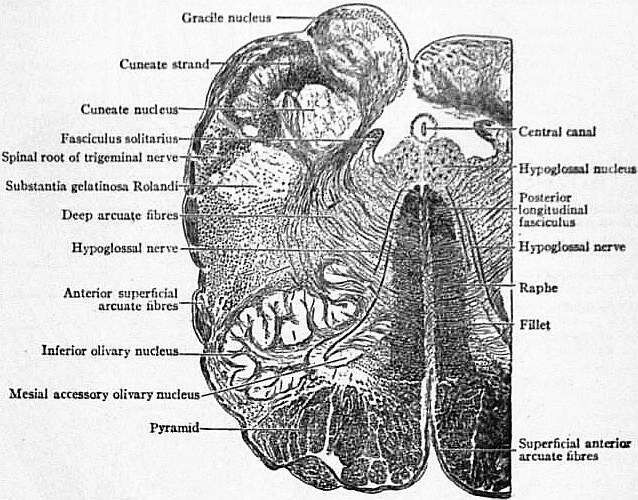 8.—Transverse Section through the Human Mesencephalon at the level of the superior Quadrigeminal Body. nerves. The third nerve is seen at the level of the superior corpus quadrigeminum running from its nucleus of origin, through the red nucleus, to a groove on the inner side of the crus called the oculo-motor groove, which marks the separation between the crusta and tegmentum. Dorsal to the Sylvian aqueduct is a layer called the lamina quadrigemina and on this the corpora quadrigemina rest. The superior pair of these bodies is overlapped by the pineal body and forms part of the lower visual centres. Connexions can be traced to the optic tract, the higher visual centre on the mesial surface of the occipital lobe, the deep origin of the third or oculo-motor nerve as well as to the mesial and lateral fillet. The inferior pair of quadrigeminal bodies are more closely in touch with the organs of hearing, and are connected by the lateral fillet with the cochlear nucleus of the auditory nerve. The peripheral part of each hemisphere, which consists of grey matter, exhibits a characteristic folded appearance, known as gyri (or convolutions) of the cerebrum. These gyri are separated from each other by fissures and sulci, some of which are considered to subdivide the hemisphere into lobes, whilst others separate the gyri in each lobe from each other. In each hemisphere of the human brain five lobes are recognized: the temporo-sphenoidal, frontal, parietal, occipital, and the central lobe or Island of Reil; it should, however, be realized that these lobes do not exactly correspond to the outlines of the bones after which they are named. Passing obliquely on the outer face of the hemisphere from before, upward and backward, is the well marked Sylvian fissure (fig. 9, s), which is the first to appear in the development of the hemisphere. Below it lies the temporo-sphenoidal lobe, and above and in front of it, the parietal and frontal lobes. As soon as it appears on the external surface of the brain the fissure divides into three limbs, anterior horizontal (s1), ascending (s2), and posterior horizontal (s3), the latter being by far the longest. The place whence these diverge is the Sylvian point and corresponds to the pterion on the surface of the skull (see Anatomy: Superficial and Artistic). Between these three limbs and the vallecula or main stem of the fissure are four triangular tongues or opercula; these are named, according to their position, orbital (fig. 9, C), frontal (pars triangularis) (B), fronto-parietal (pars basilaris) (A) and temporal. The frontal lobe is separated from the parietal by the fissure of Rolando (fig. 9, r) which extends on the outer face of the hemisphere from the longitudinal fissure obliquely downward and forward towards the Sylvian fissure. About 2 in. from the hinder end of the hemisphere is the parieto-occipital fissure, which, commencing at the longitudinal fissure, passes down the inner surface of the hemisphere, and transversely outwards for a short distance on the outer surface of the hemisphere; it separates the parietal and occipital lobes from each other. Fig. 9.—Gyri and Sulci, on the outer surface of the Cerebral Hemisphere. s1, Anterior horizontal limb (Sylvian fissure). s2, Ascending limb (Sylvian fissure). s3. Posterior horizontal limb (Sylvian fissure). ⁠horizontal limb of the Sylvian fissure. p.c.s, Superior praecentral sulcus. r, Fissure of Rolando. t1, Superior temporal sulcus (parallel sulcus). ⁠sulcus lunatus of Elliot Smith). The Temporo-Sphenoidal Lobe presents on the outer surface of the hemisphere three convolutions, arranged in parallel tiers from above downward, and named superior, middle and inferior temporal gyri. The fissure which separates the superior and middle of these convolutions is called the parallel fissure (fig. 9, t1). The Occipital Lobe also consists from above downwards of three parallel gyri, named superior, middle and inferior occipital. The Frontal Lobe is more complex; immediately in front of the fissure of Rolando, and forming indeed its anterior boundary, is a convolution named ascending frontal or pre-central, which ascends obliquely backward and upward from the Sylvian to the longitudinal fissure. Springing from the front of this gyrus, and passing forward to the anterior end of the cerebrum, are three gyri, arranged in parallel tiers from above downwards, and named superior, middle and inferior frontal gyri, which are also prolonged on to the orbital face of the frontal lobe. The Parietal Lobe is also complex; its most anterior gyrus, named ascending parietal or post-central, ascends parallel to and immediately behind the fissure of Rolando. Springing from the upper end of the back of this gyrus is the supra-parietal lobule, which, forming the boundary of the longitudinal fissure, extends as far back as the parieto-occipital fissure; springing from the lower end of the back of this gyrus is the supra-marginal, which forms the upper boundary of the hinder part of the Sylvian fissure; as this gyrus occupies the hollow in the parietal bone, which corresponds to the eminence, it may appropriately be named the gyrus of the parietal eminence. Above and behind the gyrus of the parietal eminence is the angular gyrus, which bends round the posterior extremity of the parallel fissure, while arching over the hinder end of the inferior temporo-sphenoidal sulcus is the post-parietal gyrus. Lying in the parietal lobe is the intra-parietal fissure (fig. 9, p3 and p4), which separates the gyrus of the parietal eminence from the supra-parietal lobule. Fig. 10.—Orbital surface of the left frontal lobe and the island of Reil; the tip of the temporo-sphenoidal lobe has been removed to display the latter. 17. Convolution of the margin of the longitudinal fissure. O. Olfactory fissure, over which the olfactory peduncle and lobe are situated. 1″ 1″′. Convolutions on the orbital suface. 1,1,1,1. Under surface of infero-frontal convolution. 4. Under surface of ascending frontal; and 5, of ascending parietal convolutions. C. Central lobe or insula. The Central Lobe of the hemisphere, more usually called the insula or island of Reil, does not come to the surface of the hemisphere, but lies deeply within the Sylvian fissure, the opercula forming the margin of which, conceal it. It consists of four or five short gyri, which radiate from the locus perforatus anticus, situated at the inner end of the fissure. This lobe is almost entirely surrounded by a deep sulcus called the limiting sulcus of Reil, which insulates it from the adjacent gyri. It lies opposite the upper part of the ali-sphenoid, where it articulates with the parietal and squamous-temporal. In front of the central lobe, on the base of the brain, are the orbital gyri, which are separated from one another by the orbital sulcus. This is usually H-shaped, and the gyri are therefore anterior, posterior, external and internal. Bisecting the internal orbital gyrus is an antero-posteripr sulcus (s. rectus), beneath which lies the olfactory lobe, bulbous in front, for the olfactory nerves to arise from. On the mesial surface of the hemisphere, as seen when the brain is longitudinally bisected and the cerebellum and medulla removed by cutting through the crus cerebri (see fig. 11), the divided corpus callosum is the most central object, while below it are seen the fornix, septum lucidum and third ventricle, the description of which will follow. The cerebral surface, above and in front of the corpus callosum, is divided into two by a sulcus, the contour of which closely resembles that of the upper margin of the corpus callosum. This is the calloso-marginal sulcus, so called because it separates the callosal gyrus, which lies between it and the corpus callosum, from the marginal gyri nearer the margin of the brain. When the sulcus reaches a point vertically above the hind end of the corpus callosum it turns sharply upward and so forms the hinder limit of the marginal gyri, the posterior inch or two of which is more or less distinctly marked off to form the paracentral lobule, where the upper part of the central fissure of Rolando turns over the margin of the brain. The callosal gyrus, which is also called the gyrus fornicatus from its arched appearance, is continued backward round the posterior end of the corpus callosum, and so to the mesial surface of the temporal lobe. Behind the upturned end of the calloso-marginal sulcus there is a square area which is called the precuneus or quadrate lobe; it is bounded behind by the deeply cut internal parieto-occipital fissure and this runs from the margin of the brain downward and forward to join another fissure, the calcarine, at an acute angle, thus enclosing a wedge-shaped piece of brain called the cuneus between them. The calcarine fissure is fairly horizontal, and is joined about its middle by the internal parieto-occipital, so that the part in front of the junction is called the pre-calcarine, and that behind the post-calcarine fissure. The internal parieto-occipital and calcarine are real fissures, because they cause an elevation in the interior of the brain, known as the hippocampus minor. Just in front of the anterior end of the calcarine fissure the callosal gyrus is constricted to form the isthmus which connects it with the hippocampal or uncinate gyrus. Below the calcarine fissure is a gyrus called the gyrus lingualis, and this is bounded below by another true fissure, the collateral, which runs parallel to the calcarine, but is continued much farther forward into the temporal lobe and so forms the lower boundary of the hippocampal gyrus. It will thus be seen that the hippocampal gyrus is continuous posteriorly with the callosal gyrus above by means of the isthmus, and with the gyrus lingualis below. The hippocampal gyrus is bounded above by the dentate or hippocampal fissure which causes the hippocampus major in the descending cornu and so is a complete fissure. If its lips are separated the fascia dentata or gyrus dentatus and the fimbria continued from the posterior pillar of the fornix are seen. Anteriorly the fissure is arrested by the recurved process of the upper part of the hippocampal gyrus, called the uncus, and in front of this a slight sulcus, the incisura temporalis, marks off the temporal pole or tip of the temporal lobe from the region of the uncus. It will be seen that the callosal gyrus, isthmus, and hippocampal gyrus form nearly a complete ring, and to this the name of limbic lobe is given. If a horizontal slice be removed from the upper part of each hemisphere (see fig. 12), the peripheral grey matter of the gyri will be seen to follow their various windings, whilst the core of each gyrus consists of white matter continuous with a mass of white matter in the interior of the hemisphere. If a deeper slice be now made down to the plane of the corpus callosum, the white matter of that structure will be seen to be continuous with the white centre of each hemisphere known as the centrum ovale. The corpus callosum does not equal the hemispheres in length, but approaches nearer to their anterior than their posterior ends. It terminates behind in a free rounded end, named the splenium (see fig. 11), whilst in front it forms a knee-shaped bend, and passes downwards and backwards as far as the lamina cinerea. If the dissection be performed on a brain which has been hardened in spirit, the corpus callosum is seen to consist almost entirely of bundles of nerve fibres, passing transversely across the mesial plane between the two hemispheres; these fibres may be traced into the white cores and grey matter of the gyri, and connect the gyri, though by no means always corresponding ones, in the opposite hemispheres. Hence the corpus callosum is a connecting or commissural structure, which brings the gyri of the two hemispheres into anatomical and physiological relation with each other. On the surface of the corpus callosum a few fibres, the striae longitudinales, run in the antero-posterior or longitudinal direction (see fig. 12, b). Their morphological interest is referred to in the section below on Comparative Anatomy. In the sulcus between the corpus callosum and the limbic lobe a narrow band of fibres called the cingulum is seen, most of its fibres only run a short distance in it and link together adjacent parts of the brain. If the corpus callosum be now cut through on each side of its mesial line, the large cavity or lateral ventricle in each hemisphere will be opened into. From Cunningham, Text-The book of Anatomy. Fig. 11.—The Gyri and Sulci on the Mesial Aspect of the Cerebral Hemisphere. ⁠r, Fissure of Rolando. r, o, Rostral sulcus. i, t, Incisura temporalis. The lateral ventricle is subdivided into a central space or body, and three bent prolongations or cornua; the anterior cornu extends forward, outward and downward into the frontal lobe; the posterior cornu curves backward, outward and inward into the occipital lobe; the descending cornu curves backward, outward, downward, forward and inward, behind and below the optic thalamus into the temporo-sphenoidal lobe. On the floor of the central space may be seen from before backward the grey upper surface of the pear-shaped caudate nucleus of the corpus striatum (figs. 12 and 13, f), and to its inner and posterior part a small portion of the optic thalamus, whilst between the two is the curved flat band, the taenia semicircularis (figs. 12 and 13, g). Resting on the upper surface of the thalamus is the vascular fringe of the velum interpositum, named choroid plexus, and immediately internal to this fringe is the free edge of the white posterior pillar of the fornix. The anterior cornu has the anterior end of the corpus striatum projecting into it. The posterior cornu has an elevation on its floor, the hippocampus minor (fig. 12, n), and between this cornu and the descending cornu is the elevation called eminentia collateralis, formed by the collateral fissure (fig. 12, o). Fig. 12.—To show the Right Ventricle and the left half of the Corpus Callosum. d, Posterior cornua of lateral ventricle. Extending down the descending cornu and following its curvature is the hippocampus major, which terminates below in a nodular end, the pes hippocampi; on its inner border is the white taenia hippocampi, continuous above with the posterior pillar of the fornix. If the taenia be drawn to one side the hippocampal fissure is exposed, at the bottom of which the grey matter of the gyrus hippocampi may be seen to form a well-defined dentated border (the so-called fascia dentala). The choroid plexus of the pia mater turns round the gyrus hippocampi, and enters the descending cornu through the lateral part of the great transverse fissure between the taenia hippocampi and optic thalamus. The lateral ventricle is lined by a ciliated epithelium called the ependyma. This lining is continuous through the foramen of Monro with that of the third ventricle, which again is continuous with the lining of the fourth ventricle through the aqueduct of Sylvius. A little fluid is contained in the cerebral ventricles, which, under some pathological conditions, may increase greatly in quantity, so as to occasion considerable dilatation of the ventricular cavities. If the corpus callosum be now divided about its middle by a transverse incision, and the posterior half of this structure be turned back (see fig. 13), the body of the fornix on which the corpus callosum rests is exposed. If the anterior half of the corpus callosum be now turned forward, the grey partition, or septum lucidum, between the two lateral ventricles is exposed. This septum fits into the interval between the under surface of the corpus callosum and the upper surface of the anterior part of the fornix. It consists of two layers of grey matter, between which is a narrow vertical mesial space, the fifth ventricle (fig. 13, e), and this space does not communicate with the other ventricles nor is it lined with ependyma. If the septum be now removed, the anterior part of the fornix is brought into view. The fornix is an arch-shaped band of nerve fibres extending in the antero-posterior direction. Its anterior end forms the anterior pillars of the arch, its posterior end the posterior pillars, whilst the intermediate body of the fornix forms the crown of the arch. It consists of two lateral halves, one belonging to each hemisphere. At the summit of the arch the two lateral halves are joined to form the body; but in front the two halves separate from each other, and form two anterior pillars, which descend in front of the third ventricle to the base of the cerebrum, where they form the corpora albicantia, and from these some white fibres called the bundle of Vicq d’Azyr ascend to the optic thalamus (see fig. 11). Behind the body the two halves diverge much more from each other, and form the posterior pillars, in the triangular interval between which is a thin lamina of commissural fibres called the lyra (fig. 13, a). Each posterior pillar curves downward and outward into the descending cornu of the ventricle, and, under the name of taenia hippocampi, forms the mesial free border of the hippocampus major (fig. 13, l). Eventually it ends in the substance of the hippocampus and in the uncus of the temporal lobe. If the body of the fornix be now divided by a transverse incision, its anterior part thrown forward, and its posterior part backward, the great transverse fissure of the cerebrum is opened into, and the velum interpositum lying in that fissure is exposed. The velum interpositum is an expanded fold of pia mater, which passes into the anterior of the hemispheres through the great transverse fissure. It is triangular in shape; its base is a line with the posterior end of the corpus callosum, where it is continuous with the external pia mater; its lateral margins are fringed by the choroid plexuses, which are seen in the bodies and descending cornua of the lateral ventricles, where they are invested by the endothelial lining of those cavities. Its apex, where the two choroid plexuses blend with each other, lies just behind the anterior pillars of the fornix. The interval between the apex and these pillars is the aperture of communication between the two lateral ventricles and the third, already referred to as the foramen of Monro. The choroid plexuses contain the small choroidal arteries; and the blood from these is returned by small veins, which join to form the veins of Galen. These veins pass along the centre of the velum, and, as is shown in fig. 1, open into the straight sinus. If the velum interpositum be now carefully raised from before backward, the optic thalami, third ventricle, pineal body and corpora quadrigemina are exposed. Fig. 13.—A deeper dissection of the Lateral Ventricle, and of the Velum Interpositum. b, b, Posterior pillars of the fornix, turned back. c, c, Anterior pillars of the fornix. d, Velum interpositum and veins of Galen. m, Hippocampus major in descending cornu. The optic thalamus is a large, somewhat ovoid body situated behind the corpus striatum, and above the crus cerebri. Its upper surface is partly seen in the floor of the body of the lateral ventricle, but is for the most part covered by the fornix and velum interpositum. Its postero-inferior surface forms the roof of the descending cornu of the ventricle, whilst its inner surface forms the side wall of the third ventricle. At its outer and posterior part are two slight elevations, in close relation to the optic tract, and named respectively corpus geniculatum internum and externum. The posterior knob-like extremity of the thalamus is called the pulvinar; this, as well as the two corpora geniculata and the superior corpus quadrigeminum, is connected with the optic tract. The third ventricle (see fig. 6) is a cavity situated in the mesial plane between the two optic thalami. Its roof is formed by the velum interpositum and body of the fornix; its floor by the posterior perforated space, corpora albicantia, tuber cinereum, infundibulum, and optic commissure; its anterior boundary by the anterior pillars of the fornix, anterior commissure and lamina cinerea; its posterior boundary by the corpora quadrigemina and posterior commissure. The cavity of this ventricle is of small size in the living head, for the inner surfaces of the two thalami are connected together by intermediate grey matter, named the middle or soft commissure. Immediately in front of the corpora quadrigemina, the white fibres of the posterior commissure pass across between the two optic thalami. If the anterior pillars of the fornix be separated from each other, the white fibres of the anterior commissure may be seen lying in front of them. ⁠at the Level of the Widest Part of the Lenticular Nucleus. The pineal body is a reddish cone-shaped body situated upon the anterior pair of the corpora quadrigemina (see figs. 3 and 6). From its broad anterior end two white bands, the peduncles of the pineal body, pass forward, one on the inner side of each optic thalamus. Each peduncle joins, along with the taenia semicircularis, the anterior pillar of the fornix of its own side. In its structure this body consists of tubular gland tissue containing gritty calcareous particles, constituting the brain sand. Its morphology will be referred to later. 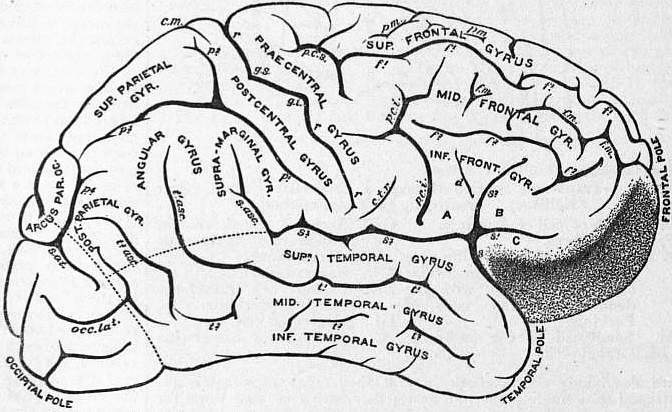 A general idea of the internal structure of the brain is best obtained by studying a horizontal section made just below the level of the Sylvian point and just above the great transverse fissure (see fig. 14). Such a section will cut the corpus callosum anteriorly at the genu and posteriorly at the splenium, but the body is above the plane of section. Behind the genu the fifth ventricle is cut, and behind that the two pillars of the fornix which here form the anterior boundary of the third ventricle. At the posterior end of this is the pineal body, which the section has just escaped. To the outer side of the fornix is seen the foramen of Munro, leading into the front of the body and anterior horn of the lateral ventricle. It will be seen that the lateral boundary of this horn is the cut caudate nucleus of the corpus striatum, while the lateral boundary of the third ventricle is the cut optic thalamus, both of which bodies have been already described, but external to these is a third triangular grey mass, with its apex directed inward, which cannot be seen except in a section. This is the lenticular nucleus of the corpus striatum, the inner or apical half of which is of a light colour and is called the globus pallidus, while the basal half is reader and is known as the putamen. External to the putamen is a long narrow strip of grey matter called the claustrum, which is sometimes regarded as a third nucleus of the corpus striatum. These masses of grey matter, taken together, are the basal nuclei of the brain. Internal to the lenticular nucleus, and between it and the caudate nucleus in front and the thalamus behind, is the internal capsule, through which run most of the fibres connecting the cerebral cortex with the crus cerebri. The capsule adapts itself to the contour of the lenticular nucleus and has an anterior limb, a bend or genu, and a posterior limb. Just behind the genu of the internal capsule is a very important region, for here the great motor tract from the Rolandic region of the cortex passes on its way to the crusta and spinal cord. Besides this there are fibres passing from the cortex to the deep origins of the facial and hypo-glossal nerves. Behind the motor tracts are the sensory, including the fillet, the superior cerebellar peduncle and the inferior quadrigeminal tract, while quite at the back of the capsule are found the auditory and optic radiations linking up the higher (cortical) and lower auditory and visual centres. Between the putamen and the claustrum is the external capsule, which is smaller and of less importance than the internal, while on the lateral side of the claustrum is the white and then the grey matter of the central lobe. As the fibres of the internal capsule run up toward the cortex they decussate with the transverse fibres of the corpus callosum and spread out to form the corona radiata. It has only been possible to deal with a few of the more important bundles of fibres here, but it should be mentioned that much of the white matter of the brain is formed of association fibres which link up different cortical areas, and which become medullated and functional after birth. This has been the subject of a great deal of research, but the results are not altogether conclusive; it seems, however, that, although the male brain is 4 to 5 oz. heavier than that of the female, its relative weight to that of the body is about the same in the two sexes. An average male brain weighs about 48 oz. and a female 43½ oz. The greatest absolute weight is found between twenty-five and thirty-five years of age in the male and a little later in the female. At birth the brain weighs comparatively much more than it does later on, its proportion to the body weight being about 1 to 6. At the tenth year it is about 1 to 14, at the twentieth 1 to 30, and after that about 1 to 36.5. In old age there is a further slight decrease in proportion. In many men of great intellectual eminence the brain weight has been large—Cuvier's brain weighed 64½ oz., Goodsir's 57½, for instance—but the exceptions are numerous. Brains over 60 oz. in weight are frequently found in quite undistinguished people, and even in idiots 60 oz. has been recorded. On the other hand, microcephalic idiots may have a brain as low as 10 or even 8½ oz., but it is doubtful whether normal intelligence is possible with a brain weighing less than 32 oz. The taller the individual the greater is his brain weight, but short people have proportionally heavier brains than tall. The weight of the cerebellum is usually one-eighth of that of the entire brain. Attempts have been made to estimate the surface area of the grey matter by dissecting it off and measuring it, and also by covering it with gold leaf and measuring that. The results, however, have not been conclusive. Further details of the brain, abundantly illustrated, will be found in the later editions of any of the standard text-books on anatomy, references to which will be found in the article on Anatomy: Modern Human. Das Menschenhirn, by G. Retzius (Stockholm, 1896), and numerous recent memoirs by G. Elliot Smith and D. J. Cunningham in the Journ. Anat. and Phys. and Anatomisch Anzeig., may be consulted. The cerebral cortex (see fig. 15) consists of a continuous sheet of grey matter completely enveloping the white matter of the hemispheres. It varies in thickness in different parts, and becomes thinner in old age, but all parts show a somewhat similar microscopic structure. Thus, in vertical section, the following layers may be made out:— 1. The Molecular Layer (Stratum zonale).—This is made up of a large number of fine nerve branchings both medullated and non-medullated. The whole forms a close network, the fibres of which run chiefly a tangential course. The cells of this layer are the so-called cells of Cajal. They possess an irregular body, giving off 4 or 5 dendrites, which terminate within the molecular layer and a long nerve fibre process or neuraxon which runs parallel to the surface of the convolution. 2. The Layer of small Pyramidal Cells.—The typical cells of this layer are pyramid-shaped, the apices of the pyramids being directed towards the surface. The apex terminates in a dendron which reaches into the molecular layer, giving off several collateral horizontal branches in its course. The final branches in the molecular layer take a direction parallel to the surface. Smaller dendrites arise from the lateral and basal surfaces of these cells, but do not extend far from the body of the cell. The neuraxon always arises from the base of the cell and passes towards the central white matter, thus forming one of the nerve-fibres of that substance. In its path it gives off a number of collaterals at right angles, which are distributed to the adjacent grey matter. Fig. 15.—Diagram to illustrate Minute Structure of the Cerebral Cortex. ⁠up in a free arborization. D. Spindle-shaped cell in stratum zonale.⁠ E. Small pyramidal cell. 3. The Layer of large Pyramidal Cells.—This is characterized by the presence of numbers of cells of the same type as those of the preceding layer, but of larger size. The nerve-fibre process becomes a medullated fibre of the white matter. 4. The Layer of Polymorphous Cells.—The cells of this layer are irregular in outline, and give off several dendrites branching into the surrounding grey matter. The neuraxon gives off a number of collaterals, and then becomes a nerve-fibre of the central white matter. Scattered through these three layers there are also a number of cells (cells of Golgi) whose neuraxon divides at once, the divisions terminating within the immediate vicinity of the cell-body. Some cells are also found in which the neuraxon, instead of running into the white matter of the brain, passes toward the surface; these are called cells of Martinotti. The medullated nerve-fibres of the white matter when traced into the cortex are seen to enter in bundles set vertically to the surface. These bundles taper and are resolved into isolated fibres in the upper parts of the pyramidal layers. The fibres constituting the bundles form two sets. (a) The centrifugal fibres consist as above described of the fibre processes of the pyramidal and polymorphous cells. (b) The centripetal fibres ascend through the cortex to terminate within the molecular layer by horizontally running branches. As they pass through they give off a number of collaterals. The position of the cells from which these fibres arise is not known. In addition to the radially arranged bundles of fibres, networks are formed by the interlacement with them of large numbers of fine medullated fibres running tangentially to the surface. These are derived chiefly from the collaterals of the pyramidal cells and of the centripetal fibres. They form two specially marked bundles, one within the layer of the polymorphous cells known as the inner band of Baillarger, and another in the layer of large pyramidal cells called the outer band of Baillarger. This latter is very thick in the calcarine region, and forms the white stria of Gennin, while the inner band is best seen in the precentral gyrus. As both these strands cross the already mentioned radial bundles at right angles, they are regarded as specialized parts of an interradial reticulum of fibres, but, nearer the surface than the radial bundles penetrate, tangential fibres are found, and here they are called the supraradial reticulum. In certain parts of the brain the fibres of this reticulum are more closely set, and form the band of Bechterew in the superficial part of the small pyramidal cell zone. From The Museum Catalogue of the Royal College of Surgeons of England. Fig. 16.—Brain of Petromyzon marinus (dorsal view). A, Brain; B, choroid plexus removed. For further information on the structure of the cerebral cortex, see A. W. Campbell, Proc. R. Soc. vols. lxxii. and lxxiv. A useful introduction to the study of the vertebrate brain is that of the Amphioxus, one of the lowest of the Chordata or animals having a notochord. Here the brain is a very slightly modified part of the dorsal tubular nerve-cord, and, on the surface, shows no distinction from the rest of that cord. When a section is made the central canal is seen to be enlarged into a cavity, the neurocoele, which, in the young animal, communicates by an opening, the neuropore, with the bottom of the olfactory pit, and so with the exterior. More ventrally another slight diverticulum probably represents the infundibulum. The only trace of an eye is a patch of pigment at the anterior end of the brain, and there are no signs of any auditory apparatus. There are only two pairs of cerebral nerves, both of which are sensory (Willey, Amphioxus, 1894). In the Cyclostomata, of which the lamprey (Petromyzon) is an example, the minute brain is much more complex, though it is still only a very slight enlargement of the anterior end of the cord. The single cavity seen in Amphioxus is here subdivided into three: an anterior or prosencephalon, a middle or mesencephalon, and a hinder or rhombencephalon. The rhombencephalon has a very slight transverse thickening in the fore-part of its roof, this is the rudimentary cerebellum (Cer. ); the rest of this part of the brain is taken up by the large medulla, the cavity of which is the fossa rhomboidalis or fourth ventricle. This fossa is roofed over by the epithelium lining the cavity of the ventricle, by pia mater and blood-vessels constituting a choroid plexus (fig. 16, B). The fourth ventricle communicates with the parts in front by means of a passage known as the aqueduct of Sylvius. The mesencephalon or mid-brain, when looked at from the dorsal surface, shows a pair of large hollow swellings, the optic lobes or corpora bigemina. Their cavities open out from the aqueduct of Sylvius, and from the nervous tissue in their walls the optic nerves derive their fibres. From the front of the prosencephalon or anterior vesicle the olfactory nerves come off, and at the base of each of these are two hollow swellings; the larger and more anterior is the olfactory bulb, the smaller and more posterior the cerebral hemisphere. Both these swellings must be regarded as lateral outgrowths from the blind front end of the original single vesicle of the brain as seen in Amphioxus, and from the anterior subdivision or prosencephalon in the lamprey. The anterior vesicle, however, is now again subdivided, and that part from which the cerebral hemispheres bud out, and the hemispheres themselves, is called the telencephalon, while the posterior part of the original prosencephalon is known as the thalamencephalon, or more rarely the diencephalon. On the dorsal surface of the thalamencephalon are two nervous masses called the ganglia habenulae; the right is much larger than the left, and from it a stalk runs forward and upward to end in the vestigial pineal body (or epiphysis), which contains rudiments of a pigmented retina and of a lens, and which is usually regarded as the remains of one of a pair of median eyes, though it has been suggested that it may be an organ for the appreciation of temperature. From the small left ganglion habenulae a still more rudimentary pineal stalk projects, and there are signs of a third outgrowth (paraphysis) in front of these. On the floor of the thalamencephalon the blind pouch-like infundibulum is in contact with the pituitary body, an outgrowth from the combined pituitary and olfactory pouch, which in the adult opens on to the top of the head just in front of the pineal area. The anterior closed end of the nerve-tube, in front of the foramina of Munro or openings from which the hemispheres have grown out, is known as the lamina terminalis, and in this is seen a little white commissure, connecting the hemispheres of opposite sides and belonging entirely to the telencephalon, known as the anterior commissure. The roof of the telencephalon is mainly epithelial, and contains no traces of cortical structure. In the posterior part of the roof of the thalamencephalon is the small posterior commissure (Ahlborn, Zeits. wiss. Zool. Bd. xxxix., 1883, p. 191). In the Elasmobranch Fish, such as the sharks and rays, the cerebellum (Cer. fig. 17) is very large and contains the layers found in all the higher vertebrates. In the mesencephalon fibres corresponding with those of the fillet of higher vertebrates can be seen, and there is a nucleus in the hinder part of the corpora bigemina foreshadowing the separation into corpora quadrigemina. There is only one pineal stalk in the roof of the thalamencephalon, and the ganglia habenulae—very constant structures in the vertebrate brain—are not so marked as in Petromyzon, but are, as usual, connected with the olfactory parts of the cerebrum, with the surface of the optic lobes (tectum opticum), and with the corpus interpedunculare (Meynert's bundle). They are united across the middle line by a small superior or habenular commissure. In the floor of the thalamencephalon are two masses of ganglionic tissue, the optic thalami. The infundibulum dilates into two rounded bodies, the lobi inferiores, while the pituitary body or hypophysis cerebri has two lateral diverticula known as sacci vasculosi. Ganglia geniculata are found for the first time in connexion with the optic tracts in the lower part of the thalamus. The olfactory lobes (fig. 17, Olf. Bulb) are very large and often separated by long stalks from the cerebral hemispheres, which are comparatively much larger than those of the Cyclostomata; their roof or pallium is nervous, but devoid of cortical structure, while in the floor in some species large anterior basal ganglia or corpora striata are found (Miklucho-Maclay, Beiträge z. vergl. Neurol., 1870; Edinger, Arch. mikr. Anat. Bd. lviii., 1901, p. 661, “Cerebellum”). The Teleostean Fish are chiefly remarkable for the great development of the optic lobes and suppression of the olfactory apparatus. The pallium is non-nervous, and the optic tracts merely cross one another instead of forming a commissure. A process of the cerebellum called valvula cerebelli projects into the cavity of each optic lobe (Rabl. Ruckhard, Arch. Anat. u. Phys., 1898, p. 345 [Pallium]; Haller, Morph. Jahrb. Bd. xxvi., 1898, p. 632 [Histology and Bibliography]). The brain of the Dipnoi, or mud fish, shows no very important developments, except that the anterior pineal organ or paraphysis is large (Saunders, Ann. and Mag. Nat. Hist. ser. 6, vol. iii., 1889, p. 157; Burkhardt, Centralnervensystem v. Protopterus, Berlin, 1892). ⁠Fig. 17.—Section of the Brain of Porbeagle Shark (Lamna). In the Amphibia the brain is of a low type, the most marked advances on that of the fish being that the anterior commissure is divided into a dorsal and ventral part, of which the ventral is the true anterior commissure of higher vertebrates, while the dorsal is a hippocampal commissure and coincides in its appearance with the presence of a small mass of cells in the outer layer of the median wall of the pallium, which is probably the first indication of a hippocampal cortex or cortex of any kind (Osborn, Journ. Morph. vol. ii., 1889, p. 51). ⁠Fig. 18.—Section of Brain of Turtle (Chelone). In the Reptilia the medulla has a marked flexure with a ventral convexity, and an undoubted cerebral cortex for the first time makes its appearance. The mesial wall of the cerebral hemisphere is divided into a large dorsal hippocampal area (fig. 18, Hip.) and a smaller ventral olfactory tubercle. Between these two a narrow area of ganglionic matter runs forward from the side of the lamina terminalis and is known as the paraterminal or precommissural area (Elliot Smith, Journ. Anat. and Phys. vol. xxxii. p. 411). To the upper lateral part of the hemisphere Elliot Smith has given the name of neopallium, while the lower lateral part, imperfectly separated from it, is called the pyriform lobe. In the Lacertilia the pineal eye, if it be an eye, is better developed than in any existing vertebrate, though even in them there is no evidence of its being used for sight. Behind the so-called pineal eye and its stalk is the epiphysis or pineal body, and sometimes there is a dorsal sac between them (see fig. 18). The middle or soft commissure appears in certain reptiles (Crocodilia and Chelonia), as does also the corpus mammillare (Edinger, Senckenberg, Naturf. Gesell. Bd. xix., 1896, and Bd. xxii., 1899; Haller, Morph. Jahrb. Bd. xxviii., 1900, p. 252). Among the birds there is great unity of type, the cerebellum is large and, by its forward projection, presses the optic lobes down toward the ventro-lateral part of the brain. The cerebral hemispheres are also large, owing chiefly to the great size of the corpora striata, which already show a differentiation into caudate nucleus, putamen and globus pallidus. The pallium is reptilian in character, though its cortical area is more extensive. The geniculate bodies are very large (Bumm, Zeits. wiss. Zool. Bd. xxxviii., 1883, p. 430; Brandis, Arch. mikr. Anat. Bd. xli., 1893, p. 623, and xliii., 1894, p. 96, and xliv., 1895, p. 534; Boyce and Warrington, Phil. Trans. vol. cxci., 1899, p. 293). Among the Mammalia the Monotremata have a cerebellum which shows, in addition to the central lobe of the lower vertebrates, a flocculus on each side, and the two halves of the cerebellum are united by a ventral commissure, the pons varolii. The pallium is reptilian in its arrangement, but that part of it which Elliot Smith has named the neopallium is very large, both in the Ornithorynchus and Echidna, a fact very difficult to account for. In the latter animal the cortical area is so extensive as to be thrown into many and deep sulci, and yet the Echidna is one of the lowliest of mammals in other respects. A well-marked rhinal fissure separates the pyriform lobe from the neopallium, while, on the mesial surface, the hippocampal fissure separates the neopallium from the hippocampal area. Just below the hippocampal fissure a specially coloured tract indicates the first appearance of the fascia dentata (see fig. 20). The anterior commissure is divided, as in reptiles, into dorsal and ventral parts, of which the latter is the larger (fig. 20, Comm. V. and D.), while just behind the dorsal part is the first appearance of the fimbria or fornix. In addition to the two fissures already named, there is, in the Echidna, one which in position and mode of formation corresponds with the Sylvian fissure of higher mammals. Elliot Smith, however, wisely refuses to homologize it absolutely with that fissure, and proposes the name of pseudosylvian for it. The pineal body is rudimentary, and the optic lobes are now, and throughout the Mammalia, subdivided into four corpora quadrigemina. Fig. 19.—Ventral and Dorsal Views of the Brain of Ornithorynchus. Among the Marsupialia the Tasmanian devil (Sarcophilus) gives a very good idea of a generalized mammalian brain, and shows a large development of the parts concerned in the sense of smell. The most important advance on the monotreme brain is that the calcarine fissure has now appeared on the posterior part of the mesial surface and causes a bulging into the ventricle, called the calcar avis or hippocampus minor, just as the hippocampal fissure causes the hippocampus major (Gervais, Nuov. Arch. Mus. tom. v., 1869; Ziehen, Jenaische Denkschr. Bd. vi., 1897). ⁠Fig. 20.—Mesial and Lateral Views of the Brain of Ornithorynchus. ⁠Fig. 21.—Mesial and Lateral Views of the Brain of the Tasmanian Devil (Sarcophilus). ⁠Fig. 22.—Dorsal and Lateral Views of the Brain of a Ratel (Mellivora indica). The brain, like the rest of the nervous system, is developed from the ectoderm or outer layer of the embryo by the formation of a groove in the mid-dorsal line. The lips of this medullary groove unite to form a canal beginning at the place where the neck of the embryo is to be. The part of the neural canal in front of the earliest union forms the brain and very early becomes constricted into three vesicles, to which the names of prosencephalon, mesencephalon and rhombencephalon are now usually given. The simple tubular brain we have seen as a permanent arrangement in Amphioxus, but the stage of the three vesicles is a transitory one, and is not found in the adult of any existing animal. From the sides of the prosencephalon, the optic vesicles grow out before the neural tube is completely closed, and eventually form the optic nerves and retinae, while, soon after this, the cerebral hemispheres bulge from the antero-dorsal part of the first primary vesicle, their points of evagination being the foramina of Munro. From the ventral parts of these cerebral hemispheres the olfactory lobes are constricted off, while just behind the openings of the foramina of Munro a constriction occurs which divides the prosencephalon into two secondary vesicles, the anterior of which, containing the foramina of Munro, is called the telencephalon, while the posterior is the thalamencephalon or diencephalon. A constriction also occurs in the hind vesicle or rhombencephalon, dividing it into an anterior part, the metencephalon, from which the cerebellum is developed, and a posterior or myelencephalon, the primitive medulla oblongata. At this stage the general resemblance of the brain to that of the lamprey is striking. Before the secondary constrictions occur three vertical flexures begin to form. The first is known as the cephalic, and is caused by the prosencephalon bending sharply downward, below and in front of the mesencephalon. The second is the cervical, and marks the place where the brain ends and the spinal cord begins; the concavity of this flexure is ventral. The third to appear has a ventral convexity and is known as the pontine, since it marks the site of the future pons Varolii; it resembles the permanent flexure in the reptilian brain. ⁠Fig. 23.—Lateral view of cerebral hemisphere of Gorilla (Anthropopithecus gorilla). It will now be seen that the original neural canal, which is lined by ciliated epithelium, forms the ventricles of the brain, while superficial to this epithelium (ependyma) the grey and white matter is subsequently formed. It has been shown by His that the whole neural tube may be divided into dorsal or alar, and ventral or basal laminae, and, as the cerebral hemispheres bud out from the dorsal part of the anterior primary vesicle, they consist entirely of alar laminae. The most characteristic feature of the human and anthropoid brain is the rapid and great expansion of these hemispheres, especially in a backward direction, so that the mesencephalon and metencephalon are hidden by them from above at the seventh month of intra-uterine life. At first the foramina of Munro form a communication not only between the third and lateral ventricles, but between the two lateral ventricles, so that the cavity of each hemisphere is continuous with that of the other; soon, however, a median longitudinal fissure forms, into which the mesoderm grows to form the falx, and so the foramina of Munro are constricted into a V-shaped canal. In the floor of the hemispheres the corpora striata are developed at an early date by a multiplication of nerve cells, and on the external surface a depression, called the Sylvian fossa, marks the position of the future central lobe, which is afterwards hidden as the lips of the fossa (opercula) gradually close in on it to form the Sylvian fissure. The real fissures are complete infoldings of the whole thickness of the vesicular wall and produce swellings in the cavity. Some of them, like the choroidal on the mesial surface, are developed very early, while the vesicle is little more than epithelial, and contain between their walls an inpushing of mesoderm to form the choroid plexus. Others, like the hippocampal and calcarine, appear in the second and third months and correspond to invaginations of the nervous tissue, the hippocampus major and minor. The sulci appear later than the fissures and do not affect the internal cavity; they are due to the rapid growth of the cortex in certain areas. The corpus callosum and fornix appear about the third month and their development is somewhat doubtful; they are probably modifications of the lamina terminalis, but they may be secondary adhesions between the adjacent surfaces of the cerebral hemispheres where the cortical grey matter has not covered the white. They begin at their antero-ventral part near the genu of the corpus callosum and the anterior pillars of the fornix, and these are the parts which first appear in the lower mammals. The original anterior vesicle from which the hemispheres evaginate is composed, as already shown, of an anterior part or telencephalon and a posterior or thalamencephalon; the whole forming the third ventricle in the adult. Here the alar and basal laminae are both found, but the former is the more important; from it the optic thalami are derived, and more posteriorly the geniculate bodies. The anterior wall, of course, is the lamina terminalis, and from it are formed the lamina cinerea, the corpus callosum, fornix and septum lucidum. The roof largely remains epithelial and is invaginated into the ventricle by the mesoderm to form the choroid plexuses of the third ventricle, but at the posterior part it develops the ganglia habenulae and the pineal body, from a structure just in front of which both a lens and retinal elements are derived in the lower forms. This is one great difference between the development of this organ and that of the true eyes; indeed it has been suggested that the pineal is an organ of thermal sense and not the remains of a median eye at all. The floor of the third ventricle is developed from the basal laminae, which here are not very important and from which the tuber cinereum and, until the fourth month, single corpus mammillare are developed. The infundibulum or stalk of the posterior part of the pituitary body at first grows down in front of the tuber cinereum and, according to Gaskel's theory, represents an ancestral mouth to which the ventricles of the brain and the central canal of the cord acted as the stomach and intestine (Quart. Journ. of Mic. Sci. 31, p. 379; and Journ. of Phys. v. 10, p. 153). The reason why the basal lamina is here small is because it contains the nuclei of no cranial nerves. The anterior and posterior commissures appear before the middle and the middle before the corpus callosum, as they do in phylogeny. In connexion with the thalamencephalon, though not really belonging to it, may be mentioned the anterior lobes of the pituitary body; these begin as an upward diverticulum from the posterior wall of the primitive pharynx or stomatodaeum about the fourth week. This pouch of Rathke, as it is called, becomes nipped off by the developing base of the skull, and its bifid blind end meets and becomes applied to the posterior part of the body, which comes down from the brain. In the mesencephalon the alar laminae form the corpora quadrigemina; these at first are bigeminal and hollow as they are in the lower vertebrates. The basal laminae thicken to form the crura cerebri. In the rhombencephalon the division into basal and alar laminae is better marked than in any other part; there is a definite groove inside the fourth ventricle, which remains in the adult as the superior and inferior fovea and which marks the separation between the two laminae. In the basal laminae are found the deep origins of most of the motor cranial nerves, while those of the sensory are situated in the alar laminae. The roof of the fourth ventricle widens out very much and remains largely epithelial as the superior and inferior medullary vela. The cerebellum develops in the anterior part of the roof of the rhombencephalon as two lateral rudiments which unite in the mid line and so form a transverse bar similar to that seen in the adult lamprey; at the end of the second month the flocculus and paraflocculus become marked, and later on a series of transverse fissures occur dividing the various lobes. Of the cerebellar peduncles the inferior develops first (third month), then the middle forming the pons (fourth month), and lastly the superior (fifth month) (Elliot Smith, Review of Neurology and Psychiatry, October 1903; W. Kuithan, “Die Entwicklung des Kleinhirns bei Säugetieren,” Munchener Med. Abhandl., 1895; B. Stroud, “Mammalian cerebellum,” Journ. of Comp. Neurology, 1895). Much of our knowledge of the tracts of fibres in the brain is due to the fact that they acquire their white sheaths at different stages of development, some long after birth. The nervous system has as its function the co-ordinating of the activities of the organs one with another. It puts the organs into such mutual relation that the animal reacts as a whole with speed, accuracy and self-advantage, in response to the environmental agencies which stimulate it. For this office of the nervous system there are two fundamental conditions. The system must be thrown into action by agencies at work in the environment. Light, gravity, mechanical impacts, and so on, which are conditions significant for animal existence, must find the system responsive and through it evoke appropriate activity in the animal organs. And in fact there have been evolved in the animal a number of structures called receptive organs which are selectively excitable by different environmental agencies. Connected with these receptive organs lies that division of the nervous system which is termed afferent because it conducts impulses inwards towards the nervous centres. This division consists of elongated nerve-cells, in man some two million in number for each half of the body. These are living threads of microscopic tenuity, each extending from a receptive organ to a central nervous mass. These central nervous masses are in vertebrates all fused into one, of which the part which lies in the head is especially large and complex, because directly connected with particularly important and delicate receptive organs. The part of the central nervous organ which lies in the head has, in consequence of its connexion with the most important receptive organs, evolved a dominant importance in the nervous system, and this is especially true of the higher n1mal forms. This head part of the central nervous organ is sufficiently different from the rest, even to anatomical examination, to have received a separate name, the brain. But the fact of its having received a separate name ought not to obscure the singleness and solidarity of the whole central nervous organ as one entity. The functions of the whole central nervous organ from region to region are essentially similar throughout. One of its essential functions is reception, via aiferent nerves, of nervous impulses generated in the receptive organs by environmental agents as stimuli In other words, whatever the nature of the agent, its result on the receptive organs enters the central nervous organ as a nervous impulse, and all segments of the central nervous organ receive impulses so generated. Further, it is not known that nervous impulses present qualitative differences among themselves It is with these impulses that the central nervous organ whether spinal cord or brain has to deal. Material and Psychical Signs of Cerebral Activity.-In the central nervous organ the action resulting from entrant impulses has issue in three kinds of ways. The reaction may die out, be suppressed, and so far as discoverable lead to nothing; or the impulses may evoke effect in either or both of two forms. lust as from the receptive organs, nerves lead into the central nervous organ, so conversely from the central organ other nerves, termed ejerent, lead to various organs of the body, especially glands and muscles The reaction of the central nervous organ to impulses poured into it commonly leads to a discharge of impulses from it into glands and muscles These centrifugal impulses are, so far as is known, qualitatively like the centripetal impulses. On reaching the glands and muscles they influence the activity of those organs. Since those organs are therefore the mechanisms in which the ultimate effect of the nervous reaction takes place, they are often termed from this point of view ejector organs. A change ensuing in effector organs is often the only sign an observer has that a nervous reaction has occurred, unless the nervous system under observation be the observer's own. If the observer turns to his own nervous system for evidence of reaction, he meets at once in numberless instances with sensation as an outcome or sign of its reaction. This effect he cannot show to any being beside himself. He can only describe it, and in describing it he cannot strictly translate it into any term of material existence. The unbridged gulf between sensation and the changes produced in effector organs necessitates a separate handling of the functions of the nervous system according as their office under consideration is sensation or material effect. This holds especially in the case of the brain, and for the following reasons. Psychosis and the Fore-Brain-Hippocrates wrote, “It is through the brain that we become mad, that delirium seizes us, that fears and terrors assail us.” “We know that pleasure and joy on the one hand and pain and grief on the other are referable to the brain. It is in virtue of it that we think, understand, see, hear, know ugliness and beauty, evil and good, the agreeable and the disagreeable.” Similarly and more precisely Descartes indicated the brain, and the brain alone, as the seat of consciousness Finally, it was Flourens who perhaps first definitely insisted on the restriction of the seat of consciousness in higher animals to that part of the brain which is the fore-brain. A functional distinction between the fore-brain and the remainder of the nervous system seems, in fact, that consciousness and physical reactions are adjunct to the fore-brain in a way in which they are not to the rest of the system. After transect ion of the spinal cord, or of the brain behind the fore-brain, psychical phenomena do not belong to the reactions of the nervous arcs posterior to the transect ion, whereas they do still accompany reactions of the nervous arcs in front and still connected with the fore-brain. A man after severance of the spinal cord does not possess in the strict sense consciousness of the limbs whose afferent nerves lie behind the place of spinal severance. He can see them with his eyes, and if the severance l1e between the arms and the legs, can feel the latter with his hands. He knows them to be a part of his body. But they are detached from his consciousness. Sensations derived from them through all other channels of sense than their own do not suffice to restore them in any adequate measure to his consciousness. He must have the sensations so called “resident” in them, that is, referred to them, without need of any logical inference. These can be yielded only by the receptive organs resident in the part itself, its skin, its joints, its muscles, &c, and can only be yielded by those receptive organs so long as the nerve impulses from them have access to the fore-brain. Consciousness, therefore, does not seem to attach to any portion of the nervous system of higher animals from which the fore-brain has been cut off. In the dog it has been found that no sign of memory, let alone intelligence, has been forthcoming after removal of the greater part of the fore brain. In lower vertebrates it is not clear that consciousness in primitive form requires always the co-operation of the fore-brain. In them the fore-brain does not seem a conditio sine qua non for psychosis-so far as we may trust the rather hazardous inferences which study of the behaviour of Hsh, &c, allows And the difference between higher and lowlier animal forms in respect of the fore-brain as a condition for psychosis becomes more marked when the Arthropoda are examined. The behaviour of some Insecta points strongly to their possessing memory, rudimentary in kind though it may be. But in them no homologue of the fore-brain of vertebrates can be indisputably made out. The head ganglia in these Invertebrates may, it is true, be analogous in function in certain Ways to the brain of vertebrates Some experiments, not plentiful, indicate that destruction of these head ganglia induces deterioration of behaviour such as follows loss of psychical functions in cases of destruction of the fore-brain in vertebrates. Though, therefore, we cannot be clear that the head ganglia of these Invertebrates are the same structure morphologically as the brain of vertebrates, they seem to hold a similar office, exercising analogous functions, including psychosis of a rudimentary kind. We can, therefore, speak of the head ganglia of Arthropods as a brain, and in doing so must remember that we denne by physiological evidence rather than by morphological. Cerebral Control over Lower Nervous Centres.-There accrues to the brain, especially to the fore-brain of higher Vertebrates, another function besides that of grafting psychical qualities upon the reactions of the nervous system. This function is exhibited as power to control in greater or less measure the pure reflexes enacted by the system. These pure reflexes have the character of fatality, in the sense that, given a particular stimulus, a particular reaction unvaryingly follows; the same group of muscles or the same gland is invariably thrown into action in the same way. Removal of the fore-brain, i e of that portion of the central nervous organ to which psychosis is adjunct, renders the nervous reactions of the animal more predictable and less variable. The animal, for instance, a dog, is given over more completely to simple reflexes. Its skin is touched and it scratches the spot, its jaw is stroked and it yawns, its rump is rubbed and it shakes itself, like a dog coming out of water; and these reactions occur fatally and inopportunely, for instance, when food is being offered to it, when the dog normally would allow no such insignificant skin stimuli as the above to defer his appropriate reaction. Goltz relates the behaviour of a dog from which almost the whole fore-brain had been removed. The animal lived healthily under the careful treatment accorded it. At feeding time a little quinine (bitter) added to its sop of meat and milk led to the morsels, after being taken into the mouth, being at once and regularly rejected. None was ever swallowed, nor was the slightest hesitation in their rejection ever obtained by any coaxing or command, or encouragement of the animal by the attendant who constantly had charge of it. On the other hand, directly an undoctored piece had entered the mouth it was swallowed at once. Goltz threw to his own house-dog a piece of the same doctored meat. The creature wagged its tail and took it eagerly, then after receiving it into its mouth pulled a wry face and hesitated, astonished. But on encouragement to go on eating it the dog did so. Perhaps it deemed it unseemly to appear ungrateful to the giver and reject the gift. It overcame its reflex of rejection, and by its self-control gave proof of the intact cerebrum it possessed. There seems a connexion between consciousness and the power to modify reflex action to meet the exigencies of the occasion. Pure reflexes are admirably adapted to certain ends. They are reactions which have long proved advantageous to the phylum of which the existent animal is the representative embodiment. But the reflexes have a machine-like fatality, and conscious aim does not forerun their execution. The subject as active agent does not direct them. Yet they lie under the control of higher centres. The cough, the eye-closure, the impulse to smile, all these can be suppressed. The innate respiratory rhythm can be modified to meet the requirements of vocal utterance. In other words, the reaction of reflex arcs is controllable by the mechanism to whose activity consciousness is adjunct. The reflexes controlled are often reactions but slightly affecting consciousness, but consciousness is very distinctly operative with the centres which exert the control. It may be that the primary aim, object and purpose of consciousness is control. “Consciousness in a mere automaton,” writes Professor Lloyd Morgan, “is a useless and unnecessary epiphenomenon.” As to how this conscious control is operative on reflexes, how it intrudes its influence on the running of the reflex machinery, little is known. The Cerebrum an Organ giving Adaptation and Readjustment of Motor Acts.—The exercise of this control and the acquirement of skilled actions have obviously elements in common. By skilled actions, we understand actions not innately given, actions acquired by training in individual experience. The controlling centres pick out from an ancestral motor action some part, and isolate and enhance that until it becomes a skilled act. The motor co-ordination ancestrally provided for the ring finger gives an extending of it only in company with extension of the fingers on either side of it. The isolated lifting of the ring finger can, however, soon be acquired by training. In such cases the higher centre with conscious effort is able to dissociate a part from an ancestral co-ordination, and in that way to add a skilled adapted act to the powers of the individual. The nervous organs of control form, therefore, a special instrument of adaptation and of readjustment of reaction, for better accommodation to requirements which may be new. The attainment of more precision and speed in the use of a tool, or the handling of a weapon, means a process in which nervous organs of control modify activities of reflex centres themselves already perfected ancestrally for other though kindred actions. This process of learning is accompanied by conscious effort. The effort consists not so much in any course of reasoning but rather in the acquiring of new sensorimotor experience. To learn swimming or skating by simple cogitation or mere visual observation is of course impossible. The new ideas requisite cannot be constructed without motor experience, and the training must include that motor experience. Hence the training for a new skilled motor manoeuvre must be simply ad hoc, and is of itself no training for another motor co-ordination. The more complex an organism the more points of contact does it have with its environment, and the more does it need readjustment amid an environment of shifting relationships. Hence the organs of consciousness and control, being organs of adaptation and readjustment of reaction, will be more pronounced the farther the animal scale is followed upward to its crowning species, man. The cerebrum and especially the cerebral cortex may be regarded as the highest expression of the nervous organ of individual adaptation of reactions. Its high development in man makes him the most successful animal on earth's surface at the present epoch. The most important part of all this adjustment in his case, as he stands now, consists doubtless in that nervous activity which is intellectual. The mentality attached to his cerebrum includes reason in higher measure than is possessed by the mentality of other animals. He, therefore, more than they, can profitably forecast the future and act suitably to meet it from memory of the past. The cerebrum has proved itself by his case the most potent weapon existent for extending animal dominance over the environment. Means and Present Aims of Physiological Study of the Brain.—The aspects of cerebral activity are therefore twofold. There is the contribution which it makes to the behaviour of the animal as seen in the creature's doings. On the other hand there is its product in the psychical life of the animal. The former of these is subject matter for physiology; the latter is especially the province of psychology. Physiology does, however, concern itself with the psychical aspect of cerebral functions. Its scope, embracing the study of the bodily organs in regard to function, includes the psychic as well as the material, because as just shown the former inextricably interlace with the latter. But the relation between the psychic phenomena and the working of the brain in regard to any data of fundamental or intimate character connecting the two remains practically as unknown to us as to the Greek philosophers. What physiology has at present to be content with in this respect is the mere assigning of certain kinds of psychic events to certain local regions of the cerebrum. This primitive quest constitutes the greater part of the “neurology” of our day, and some advance has been made along its lines. Yet how meagre are really significant facts will be clear from the brief survey that follows. Before passing finally from these general considerations, we may note that it becomes more and more clear that the brain, although an organ than can be treated as a whole, is complex in the sense that separable functions belong in some measure to its several parts. The means principally adopted in studying the functions of the brain—and it must be remembered that this study in its present phase is almost exclusively a mere search for localization—are four. These are the physiological, the clinico-pathological, the histological and the zoological. The first named proceeds by observing the effects of artificial excitation, chiefly electric, of various parts of the brain, and the defects produced by destruction or removal of circumscribed portions. The clinico-pathological proceeds by observing the disturbances of body and mind occurring in disease or injury, and ascertaining the extent of the disease or injury, for the most part post mortem. The histological method examines the microscopic structure of the various regions of the brain and the characters and arrangement of the nerve-cells composing it. The zoological follows and compares the general features of the brain, as represented in the various types of animal creation. It is on the functions of the fore-brain that interest now mainly focuses, for the reasons mentioned above. And the interest in the fore-brain itself chiefly attaches to the functions of its cortex. This is due to several causes. In man and the animals nearest him the cortex forms by far the larger part of the whole cerebral hemisphere. More than any other part it constitutes the distinctively human feature. It lies accessible to various experimental observations, as also to traumatic lesions and to the surgeon's art. It is composed of a great unbroken sheet of grey matter; for that reason it is a structure wherein processes of peculiar interest for the investigation in view are likely to occur. To make this last inference more clear a reference to the histology of nervous tissue must be made. The whole physiological function of the nervous system may be summed up in the one word “conduction.” This “conduction” may be defined as the transmission of states of excitement (nerve-impulses) along the neural arcs composing the system. The whole nervous system is built up of chains of nerve-cells (neurones) which are nervous conductors, the chains often being termed arcs. Each neurone is an elongated cell which transmits nerve-impulses from its one end to its other, without so far as is known modifying the impulses in transit, unless in that part of the nerve-cell where the nucleus lies. That part of the neurone or nerve-cell is called the perikaryon or cell-body, and from that part usually many branches of the cell (each branch being a nerve-fibre) ramify. There is no evidence that impulses are modified in transit along a branch of a nerve-cell, but there is clear evidence of manifold modification of nerve-impulses in transit along the nerve-arcs of the nervous system. These nerve-arcs are neurone-chains. In them one neurone continues the line of conduction where the immediately foregoing neurone left it. That is, the neurones are laid in conductive series, the far end of one apposed to the near end of its precursor. The place of juxtaposition of the end of one neurone against the beginning of another is called the synapse. At it the conduction which has so far been wholly intra-neuronic is replaced by an inter-neuronic process, in which the nerve impulse passes from one neurone to the next. The process there, it is natural to think, must be physiologically different from that conductive process that serves for transmission merely within the neurone itself. It may be that to this inter-neuronic conduction are due the differences between conduction in nerve-arcs and nerve-trunks (nerve-fibres) respectively. Significant of the former are changes in rhythm, intensity, excitability and modifications by summation and inhibition; in fact a number of the main features of nervous reaction. These characters impressed upon conduction in nerve arcs (neurone-chains) would therefore be traceable to the intercalation of perikarya and synapses, for both these structures are absent from nerve-trunks. It is therefore probably to perikarya and synapses that the greater part of the co-ordination, elaboration and differentiation of nervous reactions is due. Now, perikarya and synapses are not present in the white matter of the central nervous organ, any more than they are in nerve-trunks. They are confined exclusively to those portions of the central organ which consist of grey matter (so called from its naked-eye appearance). Hence it is to the great sheet of grey matter which enfolds the cerebrum that the physiologist turns, as to a field where he would expect to find evidences of the processes of cerebral co-ordination at work. It is therefore to items regarding the functions of the great sheet of cerebral cortex that we may now pass. The Cerebral Cortex and its Functions.—The main question which vexed the study of the physiology of the cerebral hemispheres in the 19th century was whether differences of function are detectible in the different regions of the hemisphere and especially in those of its cortex. One camp of experimenters and observers held that the cortex was identical in function throughout its extent. These authorities taught that the various faculties and senses suffer damage in proportion to the amount of cortex removed or injured, and that it is a matter of indifference what may be the particular region wherein the destruction takes place. Against this an opposed set of observers held that different regions perform different functions, and this latter “differential” view was raised in two wholly dissimilar forms in the first and last quarters of the 19th century respectively. In the first quarter of the century, a school, with which the name of Gall is prominently associated, held that each faculty of a set of particular so-called “faculties,” which it assumed constituted intelligence, has in the brain a spatially separate organ proper to itself. Gall's doctrine had two fundamental propositions. The first was that intelligence resides exclusively in the brain: the second, that intelligence consists of twenty-seven “faculties,” each with a separate local seat in the brain. The first proposition was not new. It is met with in Hippocrates, and it had been elaborated by Descartes and others. But Bichat in his Anatomie generale had partly wandered from the gradually established truth and referred the emotions to the visceral organs, returning to a naive view popularly prevalent. Gall's first proposition was probably raised especially in reaction against Bichat. But Gall's proposition was retrograde from the true position of the science of his time. Flourens and others of his contemporaries had already shown not only that intelligence was resident exclusively in the brain, but that it was resident exclusively in that part of the brain which is the fore-brain. Now Gall placed certain of his twenty-seven intellectual faculties in the cerebellum, which is part of the hind-brain. Gall's doctrine enjoyed enormous vogue. He himself had the gifts and the demerits of quackery. His doctrine possessed, apart from its falsity, certain other mischievous qualities. “Que ces hommes si glorieux, qui font égorger les nations par millions, sachent qu'ils n'agissent point de leur propre chef, que c'est la nature qui a placé dans leur coeur la rage de la destruction.” One of his scientific opponents rejoined, “Nay, it is not that which they should know. What they should know is that if providence has allowed to man the possibility of doing evil, it has also endowed him with the power to do good.” The main cause of the success of phrenology (q.v.) has been no doubt the common desire of men to read the characters and hidden thoughts of others by external signs. Each bump or “bosse” on the cranium was supposed to indicate the existence and degree of development of one or other of the twenty-seven “faculties.” One such “bosse” showed the development of the organ of “goodness,” and another the development of the organ of “murder.” Such an easy means to arrive at information so curious delighted many persons, and they were not willingly undeceived. Modern Localization Doctrines.—The crude localization of the phrenologists is therefore too clumsy to possess an interest it might otherwise have had as an early expression of belief in cerebral localization, a belief which other labours have subsequently justified, although on facts and lines quite different from these imagined by Gall and his followers. Patient scientific toil by the hands of E. Hitzig and D. Ferrier and their followers has slowly succeeded in obtaining certain facts about the cortex cerebri which not only show that different regions of it are concerned with different functions, but, for some regions at least, outline to some extent the kind of function exercised. It is true that the greater part of the cortex remains still terra incognita unless we are content with mere descriptive features concerning its coarse anatomy. For several scattered regions some knowledge of their function has been gained by physiological investigation. These scattered regions are the visual, the auditory, the olfactory and the precentral. The grey matter of the cerebral cortex is broadly characterized histologically by the perikarya (nerve-cells bodies) which lie in it possessing a special shape; they are pyramidal. The dendrite fibres of these cells—that is, their fibres which conduct towards the perikarya—are branches from the apex and corners of the pyramid. From the base often near its middle arises one large fibre—the axone fibre, which conducts impulses away from the perikaryon. The general appearance and arrangement of the neurones in a particle of cortical grey matter are shown in fig. 15, above. The apices of the pyramidal perikarya are turned towards the free surface of the cortex. The figure as interpreted in terms of functional conduction means that the cortex is beset with conductors, each of which collects nerve-impulses, from a minute but relatively wide field by its branched dendrites, and that these nerve-impulses converge through its perikaryon, issue by its axone, and are carried whithersoever the axone runs. In some few cells the axone breaks up into branches in the immediate neighbourhood of its own perikaryon in the cortex. In most cases, however, the axone runs off into the subjacent white matter, leaving the cortex altogether. On reaching the subjacent white matter it mingles with other fibres and takes one of the following courses:—(1) to the grey matter of the cortex of the same hemisphere, (2) to the grey matter of the cortex of the opposite hemisphere, (3) to the grey matter of the pons, (4) to the grey matter of the bulb or spinal cord. It is noteworthy that the dendrite fibres of these cortical neurones do not transgress the limits of the grey cortex and the immediate neighbourhood of the perikaryon to which they belong; whereas the discharging or axone fibre does in the vast majority of cases transgress the limits of the grey matter wherein its perikaryon lies. The cortical neurone therefore collects impulses in the region of cortex just about its perikaryon and discharges them to other regions, some not cortical or even cerebral, but spinal, &c. One question which naturally arises is, do these cells spontaneously generate their impulses or are they stirred to activity by impulses which reach them from without? The tendency of physiology is to regard the actions of the cortex as reactions to impulses communicated to the cortical cells by nerve-channels reaching them from the sense organs. The neurone conductors in the cortex are in so far considered to resemble those of reflex centres, though their reactions are more variable and complex than in the use of the spinal. The chains of neurones passing through the cortex are more complex and connected with greater numbers of associate complex chains than are those of the spinal centres. But just as the reflex centres of the cord are each attached to afferent channels arriving from this or that receptive-organ, for instance, tactile-organs of the skin, or spindles of muscle-sense, &c., so the regions of cortex whose function is to-day with some certainty localized seem to be severally related each to some particular sense-organ. The localization, so far as ascertained, is a localization which attaches separate areas of cortex to the several species of sense, namely the visual, the auditory, the olfactory, and so on. This being so, we should expect to find the sensual representation in the cortex especially marked for the organs of the great distance-receptors, the organs which—considered as sense organs—initiate sensations having the quality of projicience into the sensible environment. The organs of distance-receptors are the olfactory, the visual and the auditory. The environmental agent which acts as stimulus in the case of the first named is chemical, in the second is radiant, and in the last is mechanical. Olfactory Region of Cortex.—There is phylogenetic evidence that the development of the cortex cerebri first occurred in connexion with the distance-receptors for chemical stimuli—that is, expressed with reference to psychosis, in connexion with olfaction. The olfactory apparatus even in mammals still exhibits a neural architecture of primitive pattern. The cell which conducts impulses to the brain from the olfactory membrane in the nose resembles cells in the skin of the earthworm, in that its cell-body lies actually amid the epithelium of the skin-surface and is not deeply buried near or in the central nervous organ. Further, it has at its external end tiny hairlets such as occur in specially receptive-cells but not usually in purely nervous cells. Hence we must think that one and the same cell by its external end receives the environmental stimulus and by its deep end excites the central nervous organ. The cell under the stimulation of the environmental agent will therefore generate in itself a nervous impulse. This is the clearest instance we have of a neurone being actually excited under natural circumstances by an agent of the environment directly, not indirectly. The deep ends of these olfactory neurones having entered the central nervous organ come into contact with the dendrites of large neurones, called, from their shape, mitral. In the dog, an animal with high olfactory sense, the axone of each olfactory neurone is connected with five or six mitral cells. In man each olfactory neurone is connected with a single mitral cell only. We may suppose that the former arrangement conduces to intensification of the central reaction by summation. At the same time it is an arrangement which could tend to smother sharp differentiation of the central reaction in respect to locality of stimulus at the receptive surface. Considering the diffuse way in which olfactory stimuli are applied in comparison, for instance, with visual, the exact localization of the former can obviously yield little information of use for locating the exact position of their source. On the other hand, in the case of visual stimuli the locus of incidence, owing to the rectilinear propagation of light, can serve with extraordinary exactitude for inferences as to the position of their source. The adaptation of the neural connexions of the two organs in this respect is therefore in accord with expectation. The earliest cerebral cortex is formed in connexion with the neurone-chains coming into the central nervous organ from the patch of olfactory cells on the surface of the head. The region of cerebrum thus developed is the so-called olfactory lobe and hippocampal formation. The greater part of the cerebral hemisphere is often termed the pallium, because as its development extends it folds cloak-wise over the older structures at the base of the brain. The olfactory lobe, from its position, is sometimes called the pallium basale, and the hippocampal formation the pallium marginale; and these two parts of the pallium form what, on account of their phylogenetic history, Elliott Smith well terms the archipallium. A fissure, the limbic fissure, marks off more or less distinctly this archipallium from the rest of the pallium, a remainder which is of later development and therefore designated by Elliott Smith the neopallium. Of the archipallium, the portion which constitutes the olfactory lobe is well formed in the selachian fish. In the reptilian cerebrum the hippocampal region, the pallium marginale, coexists in addition. These are both of them olfactory in function. Even so high up in the animal scale as the lowest mammals they still form one half of the entire pallium. But in the higher apes and in man the olfactory portion of the pallium is but a small fraction of the pallium as a whole. It is indeed so relatively dwarfed and obscured as to be invisible when the brain is regarded from the side or above. The olfactory part of the pallium exhibits little variation in form as traced up through the higher animals. It is of course small in such animals as Cetaceans, which are anosmatic. In highly osmatic such as the dog it is large. The uncus, and subiculum cornu ammonis of the human brain, belong to it. Disease of these parts has been accompanied by disturbance of the sense of smell. When stimulated electrically (in the rabbit) the olfactory pallium occasions peculiar torsion of the nose and lips (Ferrier), and change, often slowing or arrested, of the respiratory rhythm. P. E. Flechsig has shown that the nerve-fibres of this part of the pallium attain the final stage of their growth, that is to say, acquire their sheaths of myelin, early in the ontogenetic development of the brain. In the human brain they are myelinate before birth. This is significant from the point of view of function, for reasons which have been made clear especially by the researches of Flechsig himself. The completion of the growth of the nerve-fibres entering and leaving the cortex occurs at very various periods in the growth of the brain. Study of the development of the fibres entering and leaving the various regions of the pallium in the human brain, discovers that the regions may be conveniently grouped into those whose fibres are perfected before birth and those whose fibres are perfected during the first post-natal month, and those whose fibres are perfected after the first but before the end of the fourth post-natal month. The regions thus marked out by completion before birth are five in number, and are each connected, as also shown by collateral evidence, with one or other particular species of sense-organ. And these regions have another character in common recognizable in the nerve-fibres entering and leaving them, namely, they possess fibres projected to or from parts of the nervous system altogether outside the cortex itself. These fibres are termed “projection” fibres. Other regions of the cortex possess fibres coming from or going to various regions of the cortex itself, but do not possess in addition, as do the five primitive cortical fields, the fibres of projection. So that the facts established by Flechsig for the regions of pallium, which other evidence already indicated as connected with the sense-organ of smell, support that evidence and bring the olfactory region of cortex into line with certain other regions of cortex similarly primarily connected with organs of sense. It will be noted that what has been achieved by these various means of study in regard to the region of the cortex to which olfactory functions are attributed amounts at present to little more than the bare ascertainment of the existence there of nervous mechanisms connected with olfaction, and to the delimiting roughly of their extent and of their ability to influence certain movements, and in man sensations, habitually associated with exercise of the olfactory organ. As to what part the cortical mechanism has in the elaboration or association of mental processes to which olfaction contributes, no evidence worth the name seems as yet forthcoming. In this respect our knowledge, or rather our want of knowledge, of the functions of the olfactory region of the cortex, is fairly typical of that to which we have to confess in regard to the other regions of the cortex, even the best known. Visual Region of the Cortex.—There is a region of the cortex especially connected with vision. The optic nerve and tract constitute the second link in the chain of neurones joining the retina to the brain. They may therefore be regarded as the equivalent of an intraspinal tract connecting the deep ends of the afferent neurones from the skin with higher nervous centres. In the bony fishes the optic tract reaches the grey matter of the optic lobe, a part of the mid-brain, to which the so-called anterior colliculus is equivalent in the mammalian brain. In the optic lobe the axones of the neurones of the optic tract meet neurones whose axones pass in turn to the motor neurones of the muscles moving the eyeballs, and also to other motor neurones. But in these fish the optic tract has no obvious connexion with the fore-brain or with any cerebral pallium. Ascending, however, to the reptilian brain is found an additional arrangement: a small portion of the optic tract passes to grey matter in front of the optic lobe. This grey matter is the lateral geniculate body. From this geniculate body a number of neurones extend to the pallial portion of the cerebrum, for in the reptilian brain the pallium is present. The portion of pallium connected with the lateral geniculate body lies above and behind the olfactory or archipallium. It is a part of what was mentioned above as neopallium. In the mammalian brain the portion of the optic tract which goes to the optic lobe (ant. colliculus of the mammal) is dwarfed by great development of the part which goes to the geniculate body and an adjoining grey mass, the pulvinar (part of the optic thalamus). From these latter pass large bands of fibres to the occipital region of the neopallium. In mammals this visual region of the cortex is distinguished in its microscopic features from the cortex elsewhere by a layer of myelinate nerve-fibres, many of which are the axones of neurones of the geniculate body and pulvinar. Thus, whereas in the bony fishes all the third links of the conductive chain from the retina lead exclusively to the final neurones of motor centres for muscles, in the mammal the majority of the third links conduct to grey matter of the cortex cerebri. The application of electric stimuli to the surface of the cortex does not for the greater part of the extent of the cortex evoke in higher mammalian brains any obvious effect; no muscular act is provoked. But from certain limited regions of the cortex such stimulation does evoke muscular acts, and one of these regions is that to which the neurones forming the third link of the conductive chain from the retina pass. The muscular acts thus provoked from that region are movements of the eyeballs and of the neck turning the head. In the monkey the movement is the turning of both eyeballs and the head away from the side stimulated. In short, the gaze is directed as to an object on the opposite side. The newer conductive chain traceable through the cortex does therefore, after all, like the older one through the optic lobe, lead ultimately to the motor neurones of the eye muscles and the neck, only it takes a longer course thither and is undoubtedly much more complex. What gain is effected by this new and as it were alternative and longer route, which takes a path up to the cerebral cortex and down again, we can only conjecture, but of one point we may rest well assured, namely, that a much richer inter-connexion with other arcs of the nervous system is obtained by the path that passes via the cortex. The functional difference between the old conductive circuit and the new can at present hardly indeed be stated even in outline. A natural inference might be that the phylogenetically older and less complex path is concerned with functions purely reflex-motor, not possessing sensation as an attribute. But fish, which possess only the older path, can be trained to seize bait of one colour and not of another colour, even against what appeared to be an original colour-preference in them. Such discrimination individually acquired seems to involve memory, though it may be rudimentary in kind. Where motor reaction to visual stimuli appears to involve memory—and without memory the training could hardly be effective—some germ of consciousness can hardly be denied to the visual reactions, although the reactions occurred in complete absence of a cortical path and indeed of a visual cortex altogether. Removal of the visual pallium in the tortoise produces little or no obvious defect in vision; but in the bird such a lesion greatly impairs the vision of the eye of the side opposite to the lesion. The impairment does not, however, amount to absolute blindness. Schrader's hawk, after removal of the pallium, reacted to movements of the mice with which it was caged. But the reactions were impaired: they lacked the sustained purpose of the normal reactions. The bird saw the mice; that was certain, for their movements across its field of vision made it turn its gaze towards them. But on their ceasing to move, the reaction on the part of the bird lapsed. Neither did their continuing to move excite the attack upon them which would have been the natural reaction on the part of the bird of prey towards its food. The bird apparently did not recognize them as prey, but saw them merely as moving objects. It saw them perhaps as things to which mental association gave no significance. Similarly, a dog after ablation of the occipital lobes of the cortex is able to see, for it avoids obstacles in its path; but if food is offered to it or the whip held up to it, it does not turn towards the food or away from the whip. It sees these things as if it saw them for the first time, but without curiosity, and as if it had no experience of their meaning. It gives no hint that it any longer understands the meaning of even familiar objects so long as these are presented to it through the sense of vision. Destruction of the visual cortex of one hemisphere alone produces in the dog impairment of vision, not as in the bird practically exclusively in the opposite eye, but in one lateral half of each eye, and that half the half opposite the hemisphere injured. Thus when the cortex destroyed is of the right cerebral hemisphere, the resultant visual defect is in the left half of the field of vision of both eyes. And this is so in man also. In man disturbances of sensation can be better studied because it is possible to obtain from him his description of his condition. The relation of the cortex cerebri to human vision can be summarized briefly as follows. The visual cortex is distinguishable in higher mammals by a thin white stripe, the stripe of Gennari, seen in its grey matter when that is sectioned. This stripe results from a layer of nerve-fibres, many of which are axones from the neurones of the lateral geniculate body and the pulvinar, the grey masses directly connected with the optic nerve-fibres. In the dog, and in such monkeys as the Macaque, the region of cortex containing this stripe traceable to optic fibres forms practically the whole occipital lobe. But in the man-like apes and in man this kind of cortex is confined to one region of the occipital lobe, namely, that of the calcarine fissure and the cuneus behind that. This region of cortex thus delimited in man is one of Flechsig's areas of earlier myelinization. It is also one of his areas possessing projection fibres; and this last fact agrees with the yielding by this area, when under electrical stimulation, of movements indicating that impulses have been discharged from it into the motor neurones of the muscles of the eyes and neck. Evidence from cases of disease show that destruction of the cortex of the upper lip of the calcarine fissure, say in the right half of the brain, causes in man impairment in the upper right-hand quadrant of both retinae: destruction of the lower lip of the fissure causes impairment in the lower right-hand quadrants. Destruction of the calcarine region of one hemisphere produces therefore “crossed hemianopia,” that is, loss of the opposite half of the field of vision. But in this hemianopia the region of central vision is always spared. That is, the piece of visual field which corresponds with the yellow spot of the retina is not affected in either eye, unless the calcarine regions of both hemispheres are destroyed. This central point of vision is connected therefore not with one side of the brain only but with both. The impairment of sight is more severe in men than in lower animals. Where the destruction of the visuo-sensory cortex in one calcarine region is complete, a candle-flame offered in the hemianopic field cannot even be perceived. It may hardly excite a reflex contraction of the pupil. In such cases the visual defect amounts to blindness. But this is a greater defect than is found in the dog even after entire removal of both occipital lobes. The dog still avoids obstacles as it walks. Its defect is rather, as said above, a complete loss of interest in the visual images of things. But a dog or monkey after loss of the visual cortex hesitates more and avoids obstacles less well in a familiar place than it does when entirely blind from loss of the peripheral organ of vision. In man extensive destruction of the visual cortex has as one of its symptoms loss of memory of localities, thus, of the paths of a garden, of the position of furniture, and of accustomed objects in the patient's own room. This loss of memory of position does not extend to spatial relations ordinarily appreciated by touch, such as parts of the patient's own person or clothing. There is nothing like this in the symptoms following blindness by loss of the eye itself. Those who lose their sight by disease of the retina retain good memorial pictures of positions and directions appreciated primarily by vision. Cases of disease are on record in which loss of visual memory has occurred without hemianopia. Visual hallucinations referred to the hemianopic side have been observed. This suggests that the function of visual memory in regard to certain kinds of percepts must belong to localities of cortex different from those pertaining to other visual percepts. The area of cortex characterized by the stripe of Gennari occupies in man, as mentioned, the calcarine and cuneate region. It is surrounded by a cortical field which, though intimately connected with it by manifold conducting fibres, &c., is yet on various grounds distinct from it. This field of cortex surrounding the visuo-sensory of the calcarine-cuneate region is a far newer part of the neopallium than the region it surrounds. Both in the individual (Flechsig) and in the phylum (Bolton, Campbell, Mott) its development occurs far later than that of the visuo-sensory which it surrounds. Flechsig finds that it has no “projection” fibres, that is, that it receives none of the optic radiations from the lower visual centres and gives no centrifugal fibres in the reverse direction. This field encompassing the visuo-sensory region differs from the latter in its microscopic structure by absence of the lower layer of stellate cells and by the presence in it of a third or deep layer of pyramidal cells (Mott). Its fibres are on the average smaller than are those of the visuo-sensory (W. A. Campbell). This zonal field is small in the lower apes, and hardly discoverable in the dog. In the anthropoid apes it is much larger. In man it is relatively much larger still. The impairment of visual memory and visual understanding in regard to direction and locality is said to be observed in man only when the injury of the cortex includes not only the calcarine-cuneate region but a wide area of the occipital lobe. From this it is argued that the zonal field is concerned with memories and recognitions of a kind based on visual perceptions. It has therefore been termed the visuo-psychic area. It is one of Flechsig's “association-areas” of the cortex. Adjoining the antero-lateral border of the just-described visuo-psychic area lies another region separate from it and yet related to it. This area is even later in its course of development than is the visuo-psychic. It is one of Flechsig's “terminal fields,” and its fibres are among the last to ripen in the whole cortex. This terminal field is large in man. It runs forward in the parietal lobe above and in the temporal lobe below. Its wide extent explains, in the opinion of Mott, the displacement of the visuo-sensory field from the outer aspect of the hemisphere in the lower monkeys to the median aspect in man. To this terminal field all the more interest attaches because it includes the angular gyrus, which authorities hold to be concerned with the visual memory of words. Study of diseased conditions of speech has shown that the power to understand written words may be lost or severely impaired although the words may be perfectly distinct to the sight and although the power to understand heard words remains good. This condition is asserted by many physicians to be referable to destruction of part of the angular gyrus. Close beneath the cortex of the angular gyrus runs a large tract of long fibres which pass from the visual cortex (see above) to the auditory cortex (see below) in the superior temporal gyrus and to the lower part of the frontal lobe. This lower part of the frontal lobe is believed—and has long been believed—to be concerned intimately with the production of the movements of speech. A difficulty besetting the investigation of the function of the angular gyrus is the fact that lesion of the cortex there is likely to implicate the underlying tract of fibres in its damage. It cannot be considered to have been as yet clearly ascertained whether the condition of want of recognition of seen words—”word-blindness”—is due to cortical injury apart from subcortical, to the angular gyrus itself apart from the underlying tract. Word-blindness seems, in the right-handed, to resemble the aphasia believed to be connected with the lower part of the frontal lobe, in that it ensues upon lesions of the left hemisphere, not of the right. In left-handed persons, on the contrary, it seems to attach to the right hemisphere. Auditory Region of the Cortex.—Besides the two great organs of distance-receptors, namely, the nose and eye, whose cerebral apparatus for sensation has just been mentioned, those of a third great distance-receptor have to be considered. The agents of stimulation of the two former are respectively chemical (olfactory) and radiant (visual); the mode of stimulation of the third is mechanical, and the sensations obtained by it are termed auditory. Their cerebral localization is very imperfectly ascertained. Electric stimuli applied to a part of the uppermost temporal gyrus excites movements of the ears and eyes in the dog. Destruction of the same region when executed on both hemispheres is argued by several observers to impair the sense of hearing. To this region of cortex fibres have been traced from the lower centres connected with the nerve-fibres coming from the cochlea of the ear. From each cochlear nerve a path has been traced which passes to the insulae and the above-mentioned temporal region of cortex of both the cerebral hemispheres. The insula is a deeper-seated area of cortex adjoining the uppermost temporal convolution. To it Flechsig's chronological studies also impute a connexion with the nerves of the ear. Early myelinization of fibres, presence of ascending and descending “projection” tracts to and from lower centres outside the cortex, calibre of fibres, microscopic characters of its cortical cells, all those kinds of indirect items of evidence that obtain for the visual cortex likewise mark out this insular-temporal area as connected fairly directly with a special sense-organ, as in fact a sensory field of the cortex; and the suspicion is that it is auditory. Clinical observation supports the view in a striking way, but one requiring, in the opinion of some, further confirmation. It is widely believed that destruction of the upper and middle part of the uppermost temporal convolution produces “word-deafness,” that is, an inability to recognize familiar words when heard, although the words are recognized when seen. More precise information regarding this auditory region of the cortex has recently been obtained by the experiments of Kalischer. These show that after removal of this region from both sides of the brain in the dog the animal shows great defect in answering to the call of its master. Whereas prior to the operation the animal will prick its ears and attend at once to the lightest call, it requires after the removal of the auditory regions great loudness and insistence of calling to make it attend and react as it did. This is the more striking in view of other experimental results obtained. Kalischer trained a number of his dogs not to take meat offered them except at the sound of a particular note given by an organ pipe or a harmonium. The dogs rapidly learned not to take the food on the sounding of notes of other pitch than the one taught them as the permissive signal. This reaction on the part of the animal was not impaired by the removal of the so-called auditory regions of the cortex. Kalischer suggests that this reaction taught by training is not destroyed by the operation which so greatly impairs the common reaction to the master's call, because the former is a simpler process more allied to reflex action. In it the attention of the dog is already fastened upon the object, namely the food, and the stimulus given by the note excites a reaction which simply allows the act of seizing the food to take place, or on the other hand stops it. In the case of answering the call of the master the stimulus has to excite attention, to produce perception of the locality whence it comes, and to invoke a complicated series of movements of response. He finds that destruction of the posterior colliculi of the mid-brain, which have long been known to be in some way connected with hearing, likewise destroys the response to the call of the master, but did not destroy the trick taught to his dogs of taking meat offered at the sound of a note of one particular pitch but not at notes of other pitch given by the same instrument. Other Senses and Localization in the Cortex Cerebri.—Turning now to the connexion between the function of the cortex and the senses other than those of the great distance-receptors just dealt with, even less is known. Disturbance and impairment of skin sensations are observable both in experiments on the cerebrum of animals and in cases of cerebral disease in man. But the localization in the cortex of regions specially or mainly concerned with cutaneous sensation has not been made sufficiently clear to warrant statement here. Still less is there satisfactory knowledge regarding the existence of cortical areas concerned with sensations originated in the alimentary canal. The least equivocal of such evidence regards the sense of taste. There is some slight evidence of a connexion between this sense and a region of the hippocampal gyrus near to but behind that related to smell. As to the sensations excited by the numerous receptors which lie not in any of the surface membranes of the body but embedded in the masses of the organs and between them, the proprioceptors, buried in muscles, tendons and joints, there is little doubt that these sensations may be disturbed or impaired by injury of the cortex cerebri. They may probably also be excited by cortical stimulation. But evidence of localization of their seat in, and their details of connexion with, the cortex, is at present uncertain. Many authorities consider it probable that sensations of touch and the sensations initiated by the proprioceptors of muscles and joints (the organs of the so-called muscular sense) are specially related to the post-central gyrus and perhaps to the pre-central gyrus also. The clearest items on this point are perhaps the following. Besides the regions instanced above, in the limbic (olfactory), occipital (visual), and temporal (auditory) lobes, as exhibiting precocity of development, there is a region showing similar precocity in the fronto-parietal portion of the hemisphere. This is the region which in the Primates includes the large central fissure (sometimes called the fissure of Rolando). To it fibres are traced which seem to continue a path of conduction that began with afferent tracts belonging to the spinal cord, and tracts which there is reason to think conduct impulses from the receptor-organs of skin and muscles. The part of the cortex immediately behind the central fissure seems to be the main cortical goal for these upward-conducting paths. That post-central strip of cortex would in this view bear to these paths a relation similar to that which the occipital and temporal regions bear to afferent tracts from the retina and the cochlea. There are observations which associate impaired tactual sense and impaired perception of posture and movement of a limb with injury of the central region of the cortex. But there are a number also which show that the motor defect which is a well-ascertained result of injury of the pre-central gyrus is sometimes unaccompanied by any obvious defect either of touch or of muscular sense. It seems then that the motor centres of this region are closely connected with the centres for cutaneous and muscular sense, yet are not so closely interwoven with them that mechanical damage inflicted on the one of necessity heavily damages the other as well. There is evidence that the sensory cortex in this region lies posterior to that which has been conveniently termed the “motor.” These latter in the monkey and the man-like apes and man lie in front of the central fissure: the sensory lie probably behind it. A. W. Campbell has found changes in the cortex of the post-central convolution ensuing in the essentially sensory disease, tabes dorsalis, a disease in which degeneration of sensory nerve-fibres of the muscular sense and of the skin senses is prominent. He considers that in man and the man-like apes the part of the post-central gyrus which lies next to and enters into the central fissure is concerned with simpler sensual recognitions, while the adjoining part of that convolution farther back is a “psychic region” concerned with more complex psychosis connected with the senses of skin and muscle. His subdivision of the post-central gyrus is based on histological differences which he discovers between its anterior and its posterior parts and on the above-described analogous differentiation of a “sensory” from a “psychic” part in the visual region of cortex. It will be noted that although certain regions of the cortex are found connected closely with certain of the main sense organs, there are important receptive organs which do not appear to have any special region of cortex assigned to their sensual products. Thus, there is the “vestibular labyrinth” of the ear. This great receptive organ, so closely connected in function with the movements and adjustment of the postures of the head and eyes, and indeed of the whole body, is prominent in the co-ordination necessary for the equilibrium of the body, an essential part of the fundamental acts of progression, standing, &c. Yet neither structural nor functional connexion with any special region of the cortex has been traced as yet for the labyrinthine receptors. Perceptions of the position of the head and of the body are of course part of our habitual and everyday experience. It may perhaps be that these perceptions are almost entirely obtained through sense organs which are not labyrinthine, but visual, muscular, tactual, and so on. The labyrinth may, though it controls and adjusts the muscular activities which maintain the balance of the body, operate reflexly without in its operation exciting of itself sensations. The results of the unconscious reflexes it initiated and guided would be perceptible through other organs of sense. But against this purely unconscious functioning of the labyrinth and its nervous apparatus stands the fact that galvanic stimulation of the labyrinth is accompanied by well-known distinctive sensations—including giddiness, &c. Moreover, the prominent factor in sea-sickness, a disorder richly suffused with sensations, is probably the labyrinth. Yet there is marked absence of evidence of any special and direct connexion between the cortex cerebri and the labyrinth organs. Also there is curiously little evidence of connexion of the cortex with the nervous paths of conduction concerned with pain. As far as the present writer can find from reference to books and from the clinical experience of others, “pain” is unknown as an aura in cortical epilepsy, or at most is of equivocal occurrence. The preceding brief exposition of some of the main features of the localization of function in the cortex cerebri, gradually deciphered by patient inquiry, shows that the scheme of partition of function so far perceptible does not follow the quaint lines of analysis of the phrenologists with their supposed mental entities, so-called “faculties.” On the contrary it is based, as some of those who early favoured a differential arrangement of function in the cerebrum had surmised, on the separateness of the incoming channels from peripheral organs of sense. These organs fall into groups separate one from another not only by reason of their spatial differentiation at the surface and in the thickness of the body, but also because each group generates sensations which introspection tells us are of a species unbridgeably separate from those generated by the other groups. Between sensations of hearing and sensations of sight there is a dissimilarity across which no intermediate series of sensual phenomena extend. The two species of sensations are wholly disparate. Similarly there is a total and impassable gap between sensations of touch and sensations of sight and sound. In other words the sensations fall into groups which are wholly disparate and are hence termed species. But within each species there exist multifold varieties of the specific sensation, e.g. sensations of red, of yellow, &c. We should expect, therefore, that the conducting paths from the receptive organs which in their function as sense-organs yield wholly disparate sensations would in so far as subserving sensation diverge and pass to separate neural mechanisms. That these sense-organs should in fact be found to possess in the cortex of the cerebrum separate fields for their sensual nervous apparatus is, therefore, in harmony with what would be the a priori supposition. But, as emphasized at the beginning of this article, the receptive organs belonging to the surfaces and the depths of the body and forming the starting-points for the whole system of the afferent nerves, have two functions more or less separate. One of these functions is to excite sensations and the other is to excite movements, by reflex action, especially in glands and muscles. In this latter function, namely the reflexifacient, all that the receptive organs effect is effected by means of the efferent nerves. They all have to use the efferent, especially the motor, nerves of the body. So rich is the connexion of the receptive organs with the efferent nerves that it is not improbable that, through the central nervous organ, each receptive organ is connected with every motor nerve of the whole nervous system,—the facts of strychnine poisoning show that if this is not literally true it is at least approximately so. Hence one of the goals to which each afferent fibre from a receptive organ leads is a number of motor nerves. Their conducting paths must, therefore, converge in passing to the starting-points of the motor nerves; because these latter are instruments common to the use of a number of different receptive organs in so far as they excite reflex actions. On the other hand those of their conducting paths which are concerned in the genesis of sensation, instead of converging, diverge, at least as far as the cortex cerebri, or if not divergent, remain separate. These considerations would make it appear likely that the conducting path from each receptive organ divides in the central nervous system into two main lines, one of which goes off to its own particular region of the cortex cerebri whither run conductors only of similar sensual species to itself, while the other main line passes with many others to a great motor station where, as at a telephone exchange, coordinate use of the outgoing lines is assured to them all. Now there is in fact a portion of the cortex in mammals the functions of which are so pre-eminently motor, as judged by our present methods, that it is commonly designated the motor cortex (see fig. 24). This region of the cortex occupies in the Primates, including Man, the pre-central gyrus. Among the items of evidence which reveal its motor capabilities are the following. Fig. 24.—Diagram of the Topography of the Main Groups of Foci in the Motor Field of Chimpanzee. The Precentral or Motor Region of the Cortex.—The application to it of electric currents excites movements in the skeletal muscles. The movements occur in the half of the body of the side crossed from that of the hemisphere excited. The “motor representation,” as it is termed, is in the cortex better described as a representation of definite actions than of particular muscles. The actions “represented” in the top part of the gyrus, namely next the great longitudinal fissure, move the leg; those in the lowest part of the gyrus belong to the tongue and mouth. The topical distribution along the length of the gyrus may be described in a general way as following a sequence resembling that of the motor representation in the spinal cord, the top of the gyrus being taken as corresponding with the caudal end of the spinal cord. The sequence as the gyrus is followed downwards runs: perineum, foot, knee, hip, abdomen, chest, shoulder, elbow, wrist, hand, eyelids and ear, nose, mouth and tongue. The nature of the movement is very fairly constant for separate points of this motor cortex as observed both in the same and in similar experiments. Thus flexion of the arm will be excitable from one set of points, and extension of the arm from another set of points; opening of the jaw from one set and closure from another, and so on. These various movements if excited strongly tend to have characters like those of the movements seen in an epileptic convulsion. Strong stimulation excites in fact a convulsion like that of epilepsy, beginning with the movement usual for the point stimulated and spreading so as to assume the proportions of a convulsion affecting the entire skeletal musculature of one half or even of the whole body. The resemblance to an epileptic seizure is the closer because the movement before it subsides becomes clonic (rhythmic) as in epilepsy. The determination of the exact spots of cortex in which are represented the various movements of the body has served a useful practical purpose in indicating the particular places in the cortex which are the seat of disease. These the physician can localize more exactly by reason of this knowledge. Hence the surgeon, if the nature of the disease is such as can be dealt with by surgical means, can without unnecessarily damaging the skull and brain, proceed directly to the point which is the seat of the mischief. The motor representation of certain parts of the body is much more liberal than is that of others. There is little correspondence between the mere mass of musculature involved and the area of the cortex devoted to its representation. Variety of movement rather than force or energy of movement seems to demand extent of cortex. The cortical area for the thumb is larger than those for the whole abdomen and chest combined. The cortical area for the tongue is larger than that for the neck. Different movements of one and the same part are very unequally represented in the cortex. Thus, flexion of the leg is more extensively represented than is extension, opening of the jaw has a much larger cortical area than has closure of the jaws. It is interesting that certain agents, for instance strychnine, and the poison of the bacilli which cause the disease known as tetanus or lock-jaw, upset this normal topography, and replace in the cortex flexion of the limb by extension of the limb, and opening of the jaw by closure of the jaw. There is, however, no evidence that they do this by changing in any way the cortical mechanisms themselves. It is more likely that their action is confined to the lower centres, bulbar and spinal, upon which the discharge excited from the cortex plays. The change thus induced in the movement excited by the cortex does, however, show that the point of cortex which causes for instance opening of the mouth is connected with the motor nerves to the closing muscles as well as with those of the opening muscles. This is an item of evidence that the “centres” of the cortex are connected with the motor nerves of antagonistic muscles in such a way that when the “centre” excites one set of the muscles to contract, it simultaneously under normal circumstances causes inhibition of the motor neurones of the opposed set of muscles (reciprocal innervation). In the great majority of movements excited from the motor cortex of a single hemisphere of the cerebrum, the movement evoked is confined to one side of the body, namely to that opposite to the hemisphere stimulated. There are, however, important exceptions to this. Thus, adduction of both vocal cords is excited from the cortex of either hemisphere. The movement of closure of the eyelids is usually bilateral, unless the stimulation be very weak; then the movement is of the eyelids of the opposite side only. The same holds true for the movements of the jaw. It, therefore, seems clear that with many movements which are usually bilaterally performed in ordinary life, such as opening of the jaw, blinking, &c., the symmetrical areas of the motor regions of both hemispheres are simultaneously in action. In regard to all these movements elicitable by artificial stimuli from the motor cortex it is obvious that were there clearer evidence that the pallial region from which they are elicitable is fairly directly connected with corticopetal paths subserving cutaneous sensation or “muscular sense,” the movements might be regarded as falling into the category of higher reflexes connected with the organs of touch, muscular sense, &c., just as the movements of the eyeball excitable from the visual cortex may be regarded as higher reflexes connected with vision. The evidence of the connexion of the reactions of the motor cortex with cutaneous and muscular senses appears, however, scarcely sufficient to countenance at present this otherwise plausible view, which has on general grounds much to commend it. It is remarkable that movements of the eyeball itself, i.e. apart from movement of the lids, are not in the category of movements elicitable from the precentral gyrus, the “motor” cortex. They are found represented in a region farther forward, namely in front of the precentral gyrus altogether, and occupying a scattered set of points in the direction frontal from the areas for movements of arm and face. This frontal area yields on excitation conjugate movements of both eyeballs extremely like if not exactly similar to those yielded by excitation of the occipital (visual) region of the cortex. It is supposed by some that this frontal area yielding eye-movements has its function in this respect based upon afferent conductors from other parts of the eyeball than the retina, for instance upon kinaesthetic (Bastian) impressions or upon sensual impressions derived from the cornea and the coats of the eyeball including the ciliary and iris muscles. The ocular muscles are certainly a source of centripetal impulses, but their connexion with the cortex is not clear as to either their nature or their seat. The question seems for the present to allow no clearer answer. It is certain, however, that the frontal area of eye movements has corticofugal paths descending from it to the lower motor centres of the eyeballs quite independent of those descending from the occipital (visual) area of eye-movements. Further, it seems clear that in many animals there is another cortical region, a third region, the region which we saw above might be considered auditory, where movements of the eyeball similar to those elicitable in the occipital and frontal cortex can be provoked. A. Tschermak is inclined to give the eyeball movements of the frontal region the significance of reflex movements which carry the visual field in various directions in answer to demands made by sensory data derived from touch, &c., as for instance from the hand. The movements of the eyeballs elicitable from the occipital region of the cortex he regards as probably concerned with directing the gaze toward something seen, for instance, in the peripheral field of vision. The occipital movement would, therefore, be excited through the retina, and would result in bringing the yellow spot region of the retinae of both eyes to bear upon the object. This view has much to justify it. The movements of the eyeballs excited from the cortex of the auditory region would in a similar way be explicable as bringing the gaze to bear upon a direction in which a sound had been located, auditory initiation replacing the visual and tactual of the occipital and the frontal regions respectively. Turning from these still speculative matters to others less suggestive but of actual ascertainment, we find that the motor nature of the precentral cortex as ascertained by electric stimuli is further certified by the occurrence of disturbance and impairment of motor power and adjustment following destruction of that region of the cortex. The movements which such a part as a limb executes are of course manifold in purpose. The hind limb of a dog is used for standing, for stepping, for scratching, for squatting, and, where a dog, for instance, has been trained to stand or walk on its hind legs alone, for skilled acts requiring a special training for their acquisition. It is found that when the motor area of the brain has been destroyed, the limb is at first paralysed for all these movements, but after a time the limb recovers the ability to execute some of them, though not all. The scratching movement suffers little, and rapid improvement after cerebral injury soon effaces the impairment, at first somewhat pronounced, in the use of the limb for walking, running, &c., and ordinary movements of progression. Even when both hemispheres have been destroyed the dog can still stand and walk and run. Destruction of the motor region of the cortex renders the fore limbs of the dog unable to execute such skilled movements as the steadying of a bone for gnawing or the trained act of offering the paw in answer to the command of the master. Skilled acts of the limb, apart from conjoined movements in which it, together with all the other limbs, takes part, assume of course a larger share of the office of the limb in the Primates than in the dog; and this is especially true for the fore limb. It is when the fore-foot becomes a hand that opportunity is given for its more skilled individual use and for its training in movements as a tool, or for the handling of tools and weapons. It is these movements which suffer most heavily and for the longest period after injury of the motor region of the cortex. Hence the disablement ensuing upon injury to the cortex would be expected to be most apparent in the Primates; and it is so, and most of all in Man. Further, in Man there ensues a condition called “contracture,” which is not so apparent or frequent a result in other animals,—indeed, does not occur at all in other animals except the monkey. In contracture the muscles of the paretic limb are not flaccid, as they are usually in paralysis, but they are tense and the limb is more or less rigidly fixed by them in a certain position, usually one of flexion at elbow and wrist. This condition does not occur at first, but gradually supervenes in the course of a number of weeks. In Man the destruction of the motor area of the cortex cripples the limb even for the part it should play in the combined limb movements of walking, &c., and cripples it to an extent markedly contrasting with the slight disturbances seen in the lower mammals, e.g. the dog. As regards the recovery of motor power after lesions of the motor cortex, two processes seem at work which are termed respectively restitution and compensation. By the former is understood the recovery obtained when a part of a “centre” is destroyed, and the rest of the centre, although thrown out of function at first, recovers and supplements the deficiency later. An example of restitution would be the recovery from temporary hemianopia caused by a small injury in one occipital lobe. By compensation is understood the improvement of an impaired nervous function, traceable to other centres different from those destroyed supplying means to compass the reaction originally dependent on the centres subsequently destroyed. Instances of such compensation are the recovery of taxis for equilibrium subsequent to destruction of the labyrinth of the ear, where the recovery is traceable to assistance obtained through the eye. It will be noted that these instances of recovery by restitution and by compensation respectively are taken, from cases of injury inflicted on receptive rather than on motor centres. It is doubtful how far they really apply to the undoubted improvement that does within certain limits progress and succeed in partially effacing the paresis immediately consequent on lesions of the motor area. It has to be remembered that in all cases of traumatic injury to the nervous system, especially where the trauma implicates the central nervous organ, the first effects and impairment of function resulting are due to a mixed cause, namely on the one hand the mechanical rupture of conducting paths actually broken by solution of their continuity, and on the other hand the temporary interruption of conducting paths by “shock.” Shock effects are not permanent: they pass off. They are supposed to be due to a change at the synapses connecting neurone with neurone in the grey matter. They amount in effect to a long-lasting and gradually subsiding inhibition. For diseases of the brain see Neuropathology, Insanity, Skull (Surgery), &c.
↑ The literature of the pineal region is enormous. Studnicka (in Oppels Vergleichende mikrosk. Anat. Teile 4-5, 1904, 1905) gives 285 references. The present conception of the generalized arrangement is: (α) A single glandular median organ from the fore-brain called the paraphysis. (β) A pouch of the ependymal roof of the ventricle called the dorsal sac. (γ) A right and left epiphysis, one of which may be wholly or partially suppressed. These may change their position to anterior and posterior in some animals. This page was last edited on 11 July 2015, at 20:47.